본 발명은 (메트)아크릴로일 부분에 부착된 사이클릭 알릴릭 설파이드 부분을 포함하는 적어도 하나의 하이브리드 단량체를 함유하는 치과용 조성물을 특징으로 한다. The invention features a dental composition comprising at least one hybrid monomer comprising a cyclic allyl sulfide metallic parts are attached to one part of the (meth) acrylate. 전형적으로 이들 2개의 작용성 부분은 화학 결합을 통하여 또는 몇몇 화학적 구조 또는 스페이서 분자를 통하여 서로 직접적으로 결합된다. Typically, the two functional parts are coupled directly to one another via a chemical bond or via a spacer molecule, or some chemical structure. 이 조성물은 전형적으로 치과용 조성물에 사용되는 에틸렌계 불포화 화합물과 같은 추가의 중합성 화합물을 선택적으로 함유할 수도 있다. The composition typically may optionally contain additional polymerizable compounds, such as ethylenically unsaturated compound used in the dental composition. 본 발명은 일반적으로 수복 치과학(restorative dentistry)에서 유용한 경화성 치과용 조성물에 관한 것이다. The present invention generally relates to a curable dental composition useful in restorative dentistry (restorative dentistry). 더 구체적으로는, 본 발명은 낮은 중합 수축성을 나타내는 자유 라디칼 개환 사이클릭 알릴릭 설파이드 단량체를 함유하는 경화성 치과용 조성물에 관한 것이다. 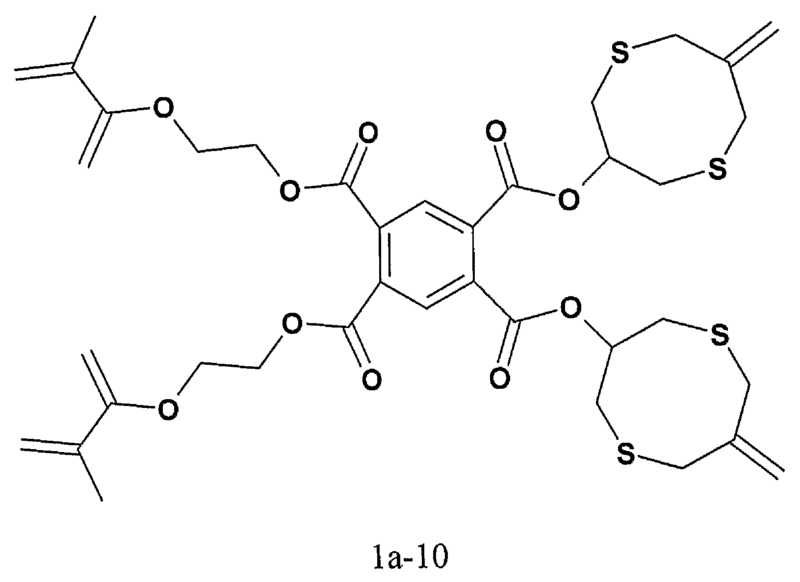 More particularly, the present invention relates to a curable dental composition comprising the free radical ring-opening cyclic allyl sulfide rigs monomer showing the low polymerization shrinkage. 유기 수지 및 충전제(filler)로 만들어진 치과용 복합재(composite)는 그의 탁월한 미적 특성으로 인하여 치과 용도, 특히 수복 치과학에서 사용이 증가하고 있음이 발견되고 있다. For dental composite material made of an organic resin and a filler (filler) (composite) it has been due to their excellent aesthetic properties found to increasing use in dental applications, especially in restorative dentistry. 전형적인 치과용 복합 수지는 저점도 다이(메트)아크릴레이트 단량체를 포함하며, 상기 단량체는 높은 충전제 수준을 용이하게 하는 희석제로서의 역할을 한다. Typical dental composite resin for a low viscosity includes a di (meth) acrylate monomer, the monomer acts as a diluent to facilitate high filler levels. 이들 희석제는 일반적으로 작은 분자량의 (메트)아크릴레이트, 예를 들어 트라이에틸렌글리콜 다이메타크릴레이트(TEGDMA)이며, 이는 그의 낮은 분자량으로 인하여 중합시 상당히 수축된다. These diluents are generally contains a (meth) acrylate, examples of the low molecular weight, and triethylene glycol dimethacrylate (TEGDMA), which is significantly shrink during the polymerization due to its low molecular weight. 중합 수축은 치과적 용도에서 많은 문제점이 생기게 할 수 있다. Polymerization shrinkage may be causing a lot of problems in dental applications. 예를 들어, 중합 수축은 흔히 복합재와 치아 구조 사이에 간격을 야기하며, 이는 수술 후 민감성, 미세 누출, 에나멜질 변연부 균열, 및 이차 우식이 생기게 할 수 있다. For example, the polymerization shrinkage often causes gaps between the composite and the tooth structure, which may result in a sensitivity, microleakage, enamel marginal cracks, and secondary caries after surgery. 많은 요인들이 중합 수축에서 그 역할을 할 것으로 여겨진다. Many factors are believed to play a role in polymerization shrinkage. 수축은 단량체들 사이의 반 데르 발스(van der Waals) 거리가 공유 결합에 의해 대체되고 중합체의 패킹 밀도(packing density)가 단량체의 패킹 밀도에 비해 증가하기 때문에 발생하는 것으로 인정되었다. Shrinkage was recognized to occur because the increase compared to the van der Waals packing density (van der Waals) the distance is replaced by a covalent bond of the polymer packing density (packing density) of the monomer among the monomers. 최근, 그러한 현상을 최소화하려고 시도함으로써 중합체 수축을 감소시키려는 노력이 있어 왔지만, 현재 입수가능한 저수축 조성물 중 다수에는 치과 용도에 필요한 물리적 특성, 기계적 특성 및 광 특성이 결여되어 있다. By recent attempt to minimize such effects There have been efforts to reduce the polymer shrinks, many of which are low shrink compositions currently available are lacking in physical properties, mechanical properties and optical properties required for dental purposes. 게다가, 모든 저수축 조성물이 구강에서 사용하기에 적합한 조건 하에서 효율적으로 중합가능한 것은 아니다. Moreover, not all low-shrink compositions can efficiently polymerized under conditions suitable for the use in the oral cavity. 따라서, 이 분야에서의 상당한 진보에도 불구하고, 중합 수축은 소정 유형의 치과용 복합재를 이용하여 작업할 때 상당한 문제를 남기게 된다. Therefore, despite significant advances in the art, and the polymerization shrinkage is leaving a significant problem when working with a dental composite material for a predetermined type. 따라서, 파괴 인성 및 미적 특성과 같은 다른 유익한 특성을 희생시킴이 없이 감소된 중합체 수축성을 나타내는 새로운 복합 재료가 여전히 필요하다. Thus, a new composite material having a reduced shrinkable polymer other beneficial properties without the victimization, such as fracture toughness and aesthetics is still necessary. 본 발명은 적어도 하나의 사이클릭 알릴릭 설파이드 부분 및 적어도 하나의 (메트)아크릴로일 부분을 갖는 중합성 화합물을 함유하는 경화성 치과용 조성물을 특징으로 한다. The invention features a curable dental composition comprising a polymerizable compound having a portion in at least one of the cyclic allyl sulfide metallic part and at least one (meth) acrylate. 그러한 중합성 화합물은 본 명세서에서 하이브리드 단량체 또는 하이브리드 화합물로 지칭된다. Such polymerizable compounds are referred to herein as a hybrid or hybrid monomer compound. 사이클릭 알릴릭 설파이드 부분은 전형적으로 고리 내에 2개의 헤테로원자를 갖는 적어도 하나의 7-원 또는 8-원 고리를 포함하며, 헤테로원자 중 하나는 황이다. The cyclic allyl sulfide rigs portion typically includes at least one 7-membered or 8-membered ring having two heteroatoms in the ring, one of the hetero atoms are sulfur. 가장 전형적으로는, 둘 모두의 헤테로원자가 황이며, 이는 선택적으로 SO, SO 2 , 또는 SS 부분의 일부로서 존재할 수도 있다. Most typically, the heteroatom is sulfur for both, which may be optionally as part of an SO, SO 2, or SS part. 다른 실시 형태에서, 고리는 황 원자에 더하여 고리 내에 제2의 상이한 헤테로원자, 예를 들어 산소 또는 질소를 포함할 수도 있다. In other embodiments, the ring in addition to a sulfur atom, for different heteroatoms, in the second example, in the ring may include oxygen or nitrogen. 또한, 사이클릭 알릴릭 부분은 다수의 고리 구조를 포함할 수도 있으며, 즉 2개 이상의 사이클릭 알릴릭 설파이드 부분을 가질 수도 있다. Further, the cyclic allyl metallic part may include a plurality of ring structures, i.e. may have a cyclic allyl metallic sulfide portion of two or more. (메트)아크릴로일 부분은 바람직하게는 (메트)아크릴로일옥시(즉, (메트)아크릴레이트 부분) 또는 (메트)아크릴로일아미노(즉, (메트)아크릴아미드 부분)이다. (Meth) acryloyl portion is preferably a (meth) acryloyloxy (that is, the (meth) acrylate portion) or (meth) acryloyl amino (i.e., (meth) acrylamide portion) to. 몇몇 구현예에서, 이들 하이브리드 단량체는 사이클릭 알릴릭 설파이드 부분의 고리 구조에 직접 결합된 산소 원자를 포함한다. In some embodiments, these hybrid monomers containing an oxygen atom directly bonded to the ring structure of the cyclic allyl sulfide metallic part. 본 명세서에 사용되는 바와 같이, "고리 구조에 직접 결합된"이라는 것은 고리의 탄소 원자 중 적어도 하나는 고리의 구성원 중 하나가 아닌 산소 원자, 즉 고리 그 자체 내의 원자가 아닌 산소에 공유 결합(전형적으로 이 결합은 단일 결합임)됨을 의미한다. As used herein, it is called "bonded directly to the ring structure," at least one of the carbon atoms of the ring is covalently bonded to the oxygen atom, that is the valence of oxygen is not within the ring itself is not one of the members of the ring (typically this combination means that being a single bond). 가외사이클릭(extracyclic) 산소는 전형적으로 고리 구조의 구성원이 아니며, 상이한 고리의 구성원일 수 있다. Cyclic extra (extracyclic) oxygen is not typically as a member of the ring structure and may be a different member of the ring. 상기 화학식에서, 각각의 X는 독립적으로 S, O, N, C (예를 들어, CH 2 또는 CRR - 여기서, 각각의 R은 독립적으로 H 또는 유기 기임), SO, SO 2 , N-알킬, N-아실, NH, N-아릴, 카르복실 또는 카르보닐 기로부터 선택될 수 있되, 단 적어도 하나의 X는 S 또는 S를 포함하는 기이다. In the formula, each X is independently S, O, N, C (e.g., CH 2 or CRR - wherein each R is independently H or an organic giim), SO, SO 2, N- alkyl, N- acyl, NH, N- aryl, carboxyl or itdoe be selected from a carbonyl group, with the proviso that at least one X is a group containing S or S. 바람직하게는, 각각의 X는 S이다. Preferably, each X is S.
Y는 선택적으로 헤테로원자를 포함하는 알킬렌 (예를 들어, 메틸렌, 에틸렌 등), 카르보닐 또는 아실이거나, 존재하지 않으며, 그럼으로써 고리의 크기는 전형적으로 7-원 내지 10-원 고리로 나타나지만, 보다 큰 고리도 고려된다. Y is optionally alkylene containing a hetero atom (e.g., methylene, ethylene, etc. ), carboxylic or a carbonyl or an acyl group, does not exist, so that the size of the ring will typically appear as a 7-membered to 10-membered ring , it is also considered a larger ring. 바람직하게는, 고리는 7-원 또는 8-원 고리이며, 따라서 Y는 각각 존재하지 않거나 메틸렌이다. Preferably, the ring is 7-membered or 8-membered ring, and therefore Y is not present or methylene, respectively. Z는 O, NH, N-알킬(직쇄 또는 분지형), 또는 N-아릴(페닐 또는 치환 페닐)이다. Z is O, NH, N- alkyl (linear or branched), aryl or N- (phenyl or substituted phenyl). R' 기는 알킬렌(전형적으로 하나 초과의 탄소 원자를 갖는데, 즉 메틸렌은 제외됨), 선택적으로 헤테로원자 (예를 들어, O, N, S, SS, SO, SO2)를 포함하는 알킬렌, 아릴렌, 지환족, 카르보닐, 실록산, 아미도(-CO-NH-), 아실(-CO-O-), 우레탄(-O-CO-NH-), 및 우레아(-NH-CO-NH-) 기와, 그 조합으로부터 선택되는 링커를 나 타낸다. R 'groups are alkylene (gatneunde carbon atoms, typically more than one, that is methylene are excluded), and optionally an alkylene containing a hetero atom (e.g., O, N, S, SS, SO, SO2), an aryl alkylene, cycloaliphatic, carbonyl, siloxane, amido (-CO-NH-), acyl (-CO-O-), urethane (-O-CO-NH-), and urea (-NH-CO-NH- ) group, or produce other linkers are selected from a combination thereof. 소정 실시 형태에서, R'은 알킬렌기, 전형적으로는 메틸렌 또는 보다 긴 기를 포함하며, 이는 직쇄 또는 분지형일 수도 있고, 비치환되거나, 아릴, 사이클로알킬, 할로겐, 니트릴, 알콕시, 알킬아미노, 다이알킬아미노, 알킬티오, 카르보닐, 아실, 아실옥시, 아미도, 우레탄기, 우레아기, 사이클릭 알릴릭 설파이드 부분, 또는 그 조합으로 치환될 수 있다. In certain embodiments, R 'is an alkylene group, typically methylene or more, and include a long, which is a straight chain or may be of branched, unsubstituted, aryl, cycloalkyl, halogen, nitrile, alkoxy, alkylamino, dialkylamino amino, alkylthio, carbonyl, acyl, acyloxy, amido, may be substituted by a urethane group, a urea group, a cyclic allyl sulfide metallic parts, or a combination thereof. R"은 H 및 CH 3 으로부터 선택되며, "a" 및 "b"는 독립적으로 1 내지 3이다. R "is selected from H and CH 3," a "and" b "are independently 1-3. 선택적으로, 사이클릭 알릴릭 설파이드 부분은 고리 상에서 직쇄 또는 분지쇄 알킬, 아릴, 사이클로알킬, 할로겐, 니트릴, 알콕시, 알킬아미노, 다이알킬아미노, 알킬티오, 카르보닐, 아실, 아실옥시, 아미도, 우레탄기 및 우레아기로부터 선택되는 하나 이상의 기로 추가로 치환될 수 있다. Optionally, the cyclic allyl metallic sulfide portion is a straight-chain on the ring or branched chain alkyl, aryl, cycloalkyl, halogen, nitrile, alkoxy, alkylamino, dialkylamino, alkylthio, carbonyl, acyl, acyloxy, amino, It may be further substituted with one or more groups selected from urethane group and urea group. 바람직하게는, 선택된 치환기는 경화 반응을 방해하지 않는다. Preferably, the substituent does not interfere with the curing reaction. 바람직한 것은 비치환 메틸렌 구성원을 포함하는 사이클릭 알릴릭 설파이드 구조이다. Preferred are the cyclic allyl sulfide metallic structure including the unsubstituted methylene members. 본 발명의 전형적인 하이브리드 단량체는 고리 내에 2개의 황 원자를 포함하며, 아실기로 고리의 3-위치에 직접 부착된 링커(즉, 고리-OC(O)-)를 포함하는 8-원 사이클릭 알릴릭 설파이드 부분을 포함한다. And typical hybrid monomers of the present invention comprises two sulfur atoms in the ring, an acyl group directly attached to the 3-position of the ring linker (i. E., Rings -OC (O) -) 8-membered cyclic containing allyl Rick including the sulfide portion. 전형적으로, 하이브리드 단량체의 중량 평균 분자량(MW)은 약 400 내지 약 900 범위이며, 몇몇 실시 형태에서는 적어도 250, 더 전형적으로는 적어도 500, 가장 전형적으로는 적어도 800이다. Typically, the weight average molecular weight (MW) of the hybrid monomer is from about 400 to about 900 range, in some embodiments at least 250, more typically at least 500, most typically at least 800. 본 발명의 조성물은 추가의 단량체, 전형적으로는 에틸렌계 불포화 화합물을 선택적으로 함유할 수도 있다. The compositions of the present invention the addition of the monomers, typically may be selectively included in the ethylenically unsaturated compound. 일 실시 형태에서, 에틸렌계 불포화 화합물은 치환 (메트)아크릴 화합물, 예를 들어 다이(메트)아크릴레이트, 적어도 하나의 작용기를 갖는 지방족(메트)아크릴레이트 및/또는 방향족 작용기를 갖는 (메트)아크릴레이트를 포함한다. In one embodiment, the ethylenically unsaturated compound is a substituted (meth) acrylate compounds, such as di (meth) acrylate, an aliphatic (meth) having at least one functional acrylate and / or having an aromatic group (meth) acrylate and a rate. 적합한 치환 (메트)아크릴 화합물의 예에는 에톡실화 비스페놀 A 다이메타크릴레이트(비스EMA6), 2-하이드록시에틸 메타크릴레이트(HEMA), 비스페놀 A 다이글리시딜 다이메타크릴레이트(비스GMA), 우레탄 다이메타크릴레이트(UDMA), 트라이에틸렌 글리콜 다이메타크릴레이트(TEGDMA), 글리세롤 다이메타크릴레이트(GDMA), 에틸렌글리콜 다이메타크릴레이트, 네오펜틸글리콜 다이메타크릴레이트(NPGDMA) 및 폴리에틸렌글리콜 다이메타크릴레이트(PEGDMA)가 포함되지만, 이로 한정되는 것은 아니다. Suitable optionally substituted (meth) acrylate Examples of the compounds include ethoxylated bisphenol A dimethacrylate (bis EMA6), 2- hydroxyethyl methacrylate (HEMA), bisphenol A diglycidyl dimethacrylate (bis-GMA), urethane dimethacrylate (UDMA), triethylene glycol dimethacrylate (TEGDMA), glycerol dimethacrylate (GDMA), glycol dimethacrylate, neopentyl glycol dimethacrylate (NPGDMA), and polyethylene glycol dimethacrylate contain methacrylate (PEGDMA), but is not limited thereto. 본 발명의 조성물은 전형적으로 개시제 시스템, 바람직하게는 예를 들어 약 300 내지 약 600 ㎚ 범위의 광을 흡수할 수 있는 아실포스핀 옥사이드 광개시제를 포함하는 광개시제 시스템 및/또는 아이오도늄염, 전자 공여체 및 감광제를 포함하는 3성분(tertiary) 광개시제 시스템을 또한 포함한다. The compositions of the present invention is typically an initiator system, preferably, for example, about 300 to about 600 ㎚ FIG acyl phosphine photoinitiator system and / or iodo, which comprises a pin oxide photoinitiator in the light can be absorbed in the range of salt, an electron donor and three components (tertiary) a photoinitiator system comprising a photosensitive agent is also included. 본 조성물은 자유 라디칼 중합성 작용기를 포함하는 실란으로 선택적으로 처리된, 치과 재료에서 전형적으로 사용되는 종류의 하나 이상의 충전제를 선택적으로 함유한다. The compositions optionally contain a filler, typically one or more types of silane used in the process optionally, a dental material comprising a free radically polymerizable functional group. 본 발명의 조성물은 치관(crown) 및 브리지(bridge) 재료, 충전제, 접착제, 실란트(sealant), 인레이(inlay), 온레이(onlay), 라미네이트 베니어(laminate veneer), 루팅제(luting agent) 또는 시멘트(cement), 의치상(denture base) 재료, 치열 교정 재료 및 실란트와, 기타 치과용 수복 재료를 비롯하여 다양한 치과적 처 치 및 수복 기능에 유용하다. The compositions of the present invention crown (crown) and a bridge (bridge) materials, fillers, adhesives, sealants (sealant), the inlay (inlay), onlays (onlay), laminated veneer (laminate veneer), routing the (luting agent) or cement (cement), denture (denture base) useful in a variety of dental restorative treatment value and functionality, including the materials, orthodontic materials and sealants, and other dental restorative materials. 조성물 중 사이클릭 알릴릭 설파이드 부분 및 (메트)아크릴 부분을 포함하는 하이브리드 단량체의 함유는 탁월한 중합으로 이어져 수축성이 낮고 기계적 특성이 뛰어난 경화된 치과용 복합재가 형성된다. Containing the hybrid monomers containing a cyclic allyl sulfide metallic portion and the (meth) acrylic portion of the composition is formed of a low polymerization leads to excellent mechanical properties, excellent shrink properties for the cured dental composite material. 상기 개요는 본 발명의 각각의 실시 형태 또는 모든 구현예를 설명하고자 하는 것이 아니다. The summary is not intended to describe each embodiment or every implementation of the present invention. 본 발명의 다른 실시 형태, 특징 및 이점이 하기의 발명의 상세한 설명 및 청구의 범위로부터 자명해질 것이다. Will be apparent from other embodiments, features and advantages of the description and claims of the invention to a according to the present invention. 본 명세서에 사용되는 바와 같이, "경화성" 성분은, 예를 들어 경화될 수 있는 하나 이상의 화합물을 포함하는 광중합 반응 및 화학적 중합 기술(예를 들어, 에틸렌계 불포화 화합물, (메트)아크릴레이트 화합물 등의 중합에 효과적인 라디칼을 형성하는 이온 반응 또는 화학 반응)을 비롯한 중합 및/또는 가교 결합 반응을 할 수 있는 것을 말한다. As used herein, "curable" composition, for example comprising one or more compounds that can be cured photopolymerization and chemical polymerization techniques (e.g., ethylenically unsaturated compounds, (meth) acrylate compounds such as an ion polymerization reaction or chemical reaction to form a radical of the effective) including means capable of polymerization and / or crosslinking reaction. 또한, 경화 반응은 산-염기 응결 반응(acid-base setting reaction), 예를 들어 시멘트 형성 조성물(예를 들어, 폴리카르복실산아연 시멘트, 유리-이오노머 시멘트 등)에 있어서 일반적인 것을 포함한다. Further, the curing reaction is acid-include those common in the - (ionomer cements such as, for example, polycarboxylic acid zinc cement, glass), a base condensation reaction (acid-base setting reaction), for example cement-forming composition. 본 명세서에 사용되는 바와 같이, "치과용 조성물"은 예를 들어 치과용 접착제, 치열 교정용 접착제, 복합재, 수복제(restorative), 치과용 시멘트, 치열 교정용 시멘트, 실란트, 코팅, 인상(impression) 재료, 충전 재료 및 그 조합을 포함하는, 구강 환경에서 사용되는 경화성 조성물을 말한다. As used herein, the term "dental composition" is, for example, dental adhesives, orthodontic adhesives, composites, can be replicated (restorative), dental cements, orthodontic cements, sealants, coatings, impression for for (impression ) material refers to a curable composition for use in, the oral environment comprising a fill material, and combinations thereof. 몇몇 실시 형태에서, 경화성 성분을 함유하는 본 발명의 치과용 조성물은 치관, 브리지, 베니어, 인레이, 온레이, 충전제, 밀 블랭크(mill blank), 인상 재료, 치열 교정 장치, 보철(예를 들 어, 국소 의치 또는 총 의치), 및 치과적 예방 또는 수복 처치에 사용되는 피니싱(finishing) 또는 폴리싱(polishing) 기구(예를 들어, 프로피 에이전트(prophy agent), 예를 들어 컵, 브러쉬, 폴리싱제)로 이루어진 군으로부터 선택되는 치과용품의 가공을 위하여 경화될 수 있다. In some embodiments, the dental composition of the present invention containing the curing component is crown, bridge, veneer, inlay, onlay, a filler, mill blanks (mill blank), impression materials, orthodontic devices, control of the prosthesis (e.g., , partial denture or total dentures), and finishing to be used for dental prophylaxis or restorative treatment (finishing) or polishing (polishing) apparatus (e.g., a propynyl agent (prophy agent), for example, cups, brushes, polishing agent) It is selected from the group consisting of may be cured to the part of the dental article. 본 명세서에 사용되는 바와 같이, "치과용 접착제"는 충전되지 않거나 조금 충전되는 치과용 조성물(예를 들어, 40 중량％ 미만의 충전제)을 말하며, 상기 조성물은 전형적으로 경화가능한 치과 재료(예를 들어, 충전 재료)를 치아 표면에 부착시키는 데 사용된다. As used herein, the term "dental adhesive for" is unsubstituted or charge the bit dental composition to be filled means (for example, a filler of less than 40% by weight), the composition can typically cured dental materials (e.g. g., are used to attach the filler material) to a tooth surface. 경화 후, 치과용 조성물은 전형적으로 점착성이 아니거나 끈적끈적하지 않으며 따라서 감압 접착제(pressure sensitive adhesive, PSA)로 공지된 물질 부류가 아니다. After curing, the dental composition is typically not tacky or sticky and therefore does not is not a class of materials known as pressure sensitive adhesive (pressure sensitive adhesive, PSA). 본 명세서에 사용되는 바와 같이, "(메트)아크릴"은 "아크릴" 및/또는 "메타크릴"을 지칭하는 약어이다. As used herein, the term "(meth) acrylate" is an abbreviation that refers to the "acrylic" and / or "methacrylic". 예를 들어, "(메트)아크릴로일옥시" 기는 아크릴로일옥시기(즉, CH 2 =CHC(O)O-) 및/또는 메타크릴로일옥시기(즉, CH 2 =C(CH 3 )C(O)O-)를 지칭하는 약어이며, "(메트)아크릴로일"기는 아크릴로일기(즉, CH 2 =CHC(O)-) 및/또는 메타크릴로일기(즉, CH 2 =C(CH 3 )C(O)-)를 지칭하는 약어이다. For example, "(meth) acryloyloxy" group is acryloyloxy group with an acrylic (i.e., CH 2 = CHC (O) O-) acryloyloxy group in and / or methacrylate (i.e., CH 2 = C (CH 3 ) It is an abbreviation that refers to the C (O) O-), "(a diary meth) acryloyl" acrylic group (i.e., CH 2 = CHC (O) -) and / or a methacryloyl group (i.e., CH 2 = C (CH 3) C (O ) - is an abbreviation that refers to). "치환 (메트)아크릴로일 화합물"은 (메트)아크릴로일 화합물, 예를 들어 (메트)아크릴레이트 - 산소 상에 메틸 이외의 유기 치환기를 가짐 - 를 의미한다. It refers to "a substituted (meth) acrylic compound" is a (meth) compounds, such as (meth) acryloyl - having an organic substituent other than methyl on the oxygen. "감광제"는 광에 의해 개시되는 중합의 속도를 증가시키거나 중합이 일어나는 파장을 이동시키는 임의의 물질을 의미한다. The "sensitizer" refers to any material that increase the rate of polymerization is initiated by light of a wavelength or move polymerization takes place. 전형적인 감광제는 400 ㎚ 내지 520 ㎚ 범위의 일부 광을 흡수하는 모노케톤 및 다이케톤이다. Typical photosensitive agent is a mono-ketones, and diketones that absorb some light 400 ㎚ to 520 ㎚ range of. 종점(endpoint)에 의한 수치 범위의 언급은 그 범위 내에 포함되는 모든 수(예를 들어, 1 내지 5는 1, 1.5, 2, 2.75, 3, 3.80, 4 및 5를 포함함)를 포함한다. Mention of numerical ranges by endpoint (endpoint) may include any number (e.g., 1 to 5 includes 1, 1.5, 2, 2.75, 3, 3.80, 4, and 5) included in that range. 본 명세서 및 첨부된 청구의 범위에서 사용되는 바와 같이, 단수 형태는 그 내용이 명백하게 다르게 지시하지 않는 한 복수 형태를 포함한다. This specification, as used in the claims and the drawings, and the singular includes the plural form unless otherwise indicated obviously its contents. 따라서, 예를 들어 "화합물"을 함유하는 조성물에 대한 언급은 2종 이상의 화합물들의 혼합물을 포함한다. Thus, for example, reference to a composition containing "a compound" includes a mixture of two or more kinds of compounds. 본 명세서 및 첨부된 청구의 범위에서 사용되는 바와 같이, "또는"이라는 용어는 일반적으로 그 내용이 명백하게 다르게 지시하지 않는 한 "및/또는"을 포함하는 의미로 이용된다. This specification, as used in the claims and the drawings, is used to sense including "or" as used herein, typically the content is a "and / or" unless explicitly indicated otherwise. 달리 지시되지 않는 한, 본 명세서 및 청구의 범위에서 사용되는 성분의 양, 특성 측정치, 예를 들어 명암비 등을 표현하는 모든 수는 모든 경우 "약"이라는 용어로 수식되는 것으로 이해되어야 한다. All number representing the above, the description and quantity of the ingredients used in the claims, characteristic measurements, such as contrast ratio and so on, unless otherwise indicated are to be understood as being any case modified with term "about." 따라서, 반대로 지시되지 않는 한, 전술한 명세서 및 첨부된 청구의 범위에 나타낸 파라미터 수치는 본 발명의 교시를 이용하여 당업자가 얻고자 하는 원하는 특성에 따라 달라질 수 있는 근사치이다. Thus, a, the parameter values ​​shown in the scope of the foregoing specification and the appended claims, unless indicated to the contrary are approximations that may vary depending upon the desired properties sought to get a person skilled in the art using the teachings of the present invention. 최소한, 그리고 청구의 범위의 범주와 등가인 이론의 적용을 한정하려고 시도함이 없이, 각각의 파라미터 수치는 적어도 보고된 유효 자리수의 숫자 관점에서 그리고 보통의 반올림 기법에 의해 해석되어야 한다. At the very least, and without trying to limit the scope and application of the theory of equivalent scope of the claims, each numerical parameter should be construed by the numbers in terms of the number of significant digits and ordinary rounding techniques of at least reported. 본 발명의 넓은 범주를 나타내는 수치적 범위 및 파라미터가 근사치임에도 불구하고, 특정 실시예에서 나타내어지는 수치 값은 가능한 한 정확하게 보고된다. Even though the numerical ranges and parameters setting forth the broad scope of the present invention approximate, and are reported as precisely as possible, the numerical values ​​shown in the specific embodiments. 그러나, 모든 수치 값은 각각의 시험용 측정에서 발견되는 표준 편차로부터 필연적으로 생기는 특정 오차를 본질적으로 포 함한다. However, any numerical value, contains certain errors necessarily resulting from the standard deviation found in their respective testing measurements in nature. 본 발명은 중합 수축성이 낮고 기계적 특성이 뛰어나며 치과적 수복 용도에서 유용한 경화성 치과용 조성물을 제공한다. The present invention has a low shrinking polymerizable excellent mechanical properties provides a useful dental curable composition for use in dental restorations. 이들 조성물은 사이클릭 알릴릭 설파이드 부분이 (메트)아크릴 부분에 화학적으로 부착된 것을 포함하는 적어도 하나의 하이브리드 단량체를 함유한다. These compositions contain at least one hybrid monomer comprising the cyclic allyl sulfide rigs partially chemically attached to the acrylic portion of a (meth). 전형적으로 이들 2개의 작용체(functional entities)는 화학 결합을 통하여 또는 몇몇 화학적 구조 또는 스페이서(즉, 링커) 분자를 통하여 서로에게 직접적으로 결합된다. Typically, these two functional element (functional entities) is or several chemical structure or a spacer via a chemical bond (i.e., linker) is directly coupled to each other through a molecule. 본 조성물은 선택적으로 추가의 중합성 화합물, 예를 들어 에틸렌계 불포화 화합물 - 전형적으로 치과용 조성물에 사용됨 - , 예를 들어 치환 (메트)아크릴레이트 또는 유사 화합물을 함유할 수도 있다. The composition optionally additional polymerizable compounds, such as ethylenically unsaturated compounds - may contain, for example, substituted (meth) acrylate or the like compounds typically used in dental compositions. 일 실시 형태에서, 본 조성물은 개시제 시스템, 전형적으로는 광개시제 시스템을 추가로 함유하며, 상기 광개시제 시스템은 적절한 파장의 화학선으로 조사시, 조성물의 중합(또는 경화)을 개시한다. In one embodiment, the composition comprises an initiator system, and typically and further contains a photoinitiator system, said photoinitiator system initiates polymerization when irradiated with actinic radiation of the appropriate wavelength, the composition (or cured). 본 조성물은 치과 재료의 적용 이전 또는 적용 이후 경화될 (예를 들어, 통상적인 광중합 및/또는 화학적 중합 기술에 의해 중합될) 수 있다. The composition can be cured after application of the dental material before or application (e. G., Be polymerized by conventional photopolymerization and / or chemical polymerization techniques). 충전제 및 기타 선택적 첨가제가 조성물 내로 또한 혼입될 수도 있다. A filler, and other optional additives may also be incorporated into the composition. 본 발명의 하이브리드 단량체는 하이드록시-치환 사이클릭 알릴릭 설파이드 화합물로부터 제조될 수 있으며, 이는 미국 특허 제6,495,643호 (에반스(Evans) 등); Hybrid monomers according to the present invention are hydroxy-substituted and can be made from among metallic click allyl sulfide compound, which (like Evans (Evans)) U.S. Patent No. 6,495,643; 미국 특허 제6,344,556호 (에반스 등); U.S. Patent No. 6,344,556 (Evans, etc. ); 미국 특허 제6,043,361호 (에반스 등); U.S. Patent No. 6,043,361 (Evans, etc. ); WO 96/19471 (에반스 등); WO 96/19471 (Evans, etc. 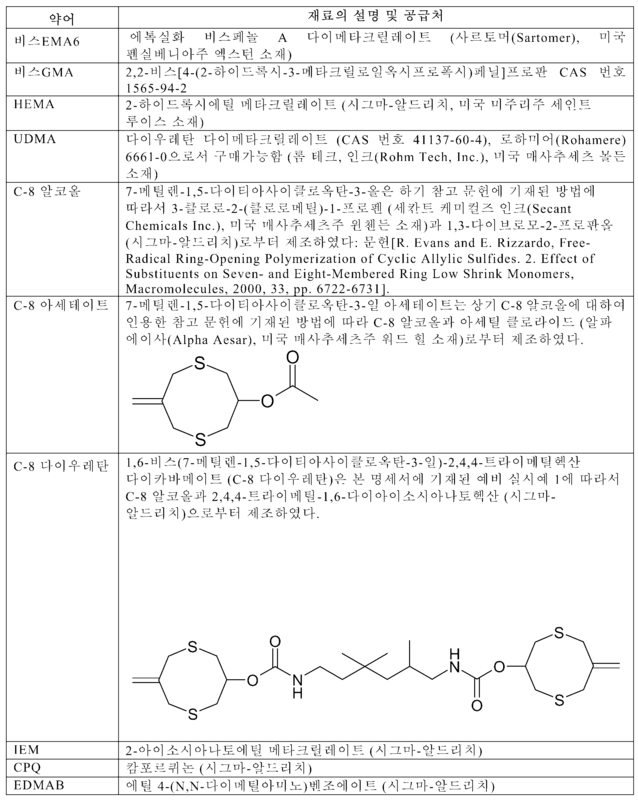 ); WO 94/14792 (리자르도(Rizzardo) 등); WO 94/14792 (Lee also cut (Rizzardo) and the like); 문헌[Richard Evans et al, New Free-Radical Ring-Opening Acrylate Monomers, Macromolecules, 1994, 27 (26), 7935-7937]; Document [Richard Evans et al, New Free-Radical Ring-Opening Acrylate Monomers, Macromolecules, 1994, 27 (26), 7935-7937]; 문헌[Richard Evans and Ezio Rizzardo, Free-Radical Ring-Opening Polymerization of Cyclic Allylic Sulfides, Marcomolecules, 1996, 29, 6983-6989]; Document [Richard Evans and Ezio Rizzardo, Free-Radical Ring-Opening Polymerization of Cyclic Allylic Sulfides, Marcomolecules, 1996, 29, 6983-6989]; 문헌[Richard Evans and Ezio Rizzardo, Free Radical Ring-Opening Polymerization of Cyclic Allylic Sulfides. Document [Richard Evans and Ezio Rizzardo, Free Radical Ring-Opening Polymerization of Cyclic Allylic Sulfides. 2. Effect of Substituents on Seven- and Eight-Membered Ring Low Shrink Monomers, Macromolecules, 2000, 33, 6722-6731], 및 문헌[Richard Evans and Ezio Rizzardo, Free Radical Ring-Opening Polymerization of Cyclic Allylic Sulfides: Liquid Monomers with Low Polymerization Volume Shrinkage, Journal of Polymer Science: Part A: Polymer Chemistry, 2001, 39, 202-215]에 기재된 소정의 것을 포함하고, 상기 특허 및 참고 문헌 모두는 본 명세서에 전체적으로 참고로 포함된다. 2. Effect of Substituents on Seven- and Eight-Membered Ring Low Shrink Monomers, Macromolecules, 2000, 33, 6722-6731], and the literature [Richard Evans and Ezio Rizzardo, Free Radical Ring-Opening Polymerization of Cyclic Allylic Sulfides: Liquid Monomers with Low Polymerization Volume Shrinkage, Journal of Polymer Science: Part a: Polymer Chemistry, 2001, and include the predetermined set forth in 39, 202-215], and the patents and references all of which are incorporated by reference entirely herein. 본 발명의 하이브리드 단량체는 하나 이상의 (메트)아크릴로일 부분을 하나 이상의 이들 하이드록시-치환 사이클릭 알릴릭 설파이드 화합물에 부착시킴으로써 생성시킬 수 있다. Hybrid monomers according to the present invention, one or more (meth) one or more of these hydroxy a portion of an acrylic hydroxy-can be produced by attaching a substituted cyclic allyl sulfide compound rigs. 바람직한 하이드록시-치환 사이클릭 알릴릭 설파이드 화합물은 C-8 알코올 (7-메틸렌-1,5-다이티아사이클로옥탄-3-올; 실시예 부분에 설명되어 있음), C-8 메탄올 (7-메틸렌-1,5-다이티아사이클로옥탄-3-메탄올), C-7 알코올 (6-메틸렌-1,4-다이티아사이클로헵탄-3-올) 및 C-7 메탄올 (6-메틸렌-1,4-다이티아사이클로헵탄-3-메탄올; 미국 특허 제6,495,643호 (에반스 등)에서 화합물 1a-4로 기재되어 있음)을 포함한다. Preferred hydroxyalkyl-substituted cyclic allyl sulfide compound is metallic C-8 Alcohol (7-methylene-1,5-dimethyl-thiazol bicyclo octane-3-ol is described in the Examples section), C-8 methanol (7 methylene-1,5-dimethyl-thiazol-3-methanol cyclooctane), C-7 alcohol (6-methylene-1,4-dimethyl-thiazol cycloheptane-3-ol), and C-7 of methanol (6-methylene-1, It includes U.S. Patent No. 6,495,643 claim that is described in (Evans, etc.) of the compound 1a-4); 4- dimethyl-3-thiazol cycloheptane methanol. 전형적으로, 본 발명의 하이브리드 단량체는 하이드록시-치환 사이클릭 알릴릭 설파이드 화합물을, 적어도 하나의 (메트)아크릴로일 부분 및 하이드록시기와 반응성인 적어도 하나의 기 (예를 들어, 산 기, 산 할라이드 기, 언하이드라이드(anhydride) 기, 또는 아이소시아네이트 기)를 갖는 유기 분자와 반응시킴으로써 얻을 수 있다. Typically, the hybrid monomers of the invention hydroxy-substituted cyclic allyl metallic sulfide compound, at least one (meth) portion and a hydroxyl group reactive with at least one group of an acrylic (e.g., an acid group, an acid by halide groups, anhydride (anhydride) group, or isocyanate group), organic molecules and having a reaction can be obtained. 유기 분자의 하이드록시-반응성 기와, 하이드록시-치환 사이클릭 알릴릭 설파이드 화합물의 반응에 의해 본 발명의 특정 하이브리드 단량체를 생성할 수 있다. Hydroxyalkyl of organic molecules-reactive group, hydroxy- may generate a particular hybrid monomers of the present invention by the reaction of a substituted cyclic allyl sulfide compound rigs. 따라서, 예를 들어 C-8 알코올은 모노-2-메타크릴로일옥시에틸 프탈레이트와 반응시켜 하이브리드 단량체 1-(2-메타크릴로일옥시에틸)-2-(7-메틸렌-1,5-다이티아옥탄-3-일) 프탈레이트 (실시예 1; 화합물 A)를 생성할 수 있다. Thus, for example, C-8 alcohol are mono-2-methacryloyloxyethyl phthalate, and reacted with the hybrid monomers of 1- (2-methacryloyloxyethyl) -2- (7-methylene-1,5- die thiazol octan-3-yl) phthalate (example 1; may generate a compound a). 대안적으로, 사이클릭 알릴릭 설파이드 화합물은 하이드록시기와 반응성인 기 (예를 들어, 산 기, 산 할라이드 기, 언하이드라이드 기, 또는 아이소시아네이트 기)로 치환되고, 하이드록시-치환 메타크릴레이트 (예를 들어, HEMA)와 반응하여 다양한 하이브리드 단량체를 생성할 수 있다. Alternatively, the cyclic allyl metallic sulfide compound is hydroxyl group and reactive group (e.g., an acid group, an acid halide group, anhydride group, or isocyanate group) which is substituted by, hydroxy-substituted methacrylate to (e.g., HEMA), and the reaction can produce a variety of hybrid monomers. 이들 합성 경로는 본 발명의 하이브리드 단량체에 대한 다수의 가능한 유기 합성 방법 중 몇몇 방법만을 나타내는 것이다. The synthetic route is shown only some ways of the plurality of organic synthesis for the hybrid monomers of the present invention. 그러한 방법은 당업자에게 잘 알려져 있다. Such methods are well known to those skilled in the art. 일 실시 형태에서, 사이클릭 알릴릭 설파이드 부분은 적어도 하나의 헤테로원자, 전형적으로는 황 원자를 갖는 7 내지 8원 고리 구조를 포함하며, 상기 황 원자는 선택적으로 SO, SO 2 , 또는 SS 부분의 일부로서 존재할 수도 있다. In one embodiment, the cyclic allyl metallic sulfide portion comprises a 7 to 8-membered ring structure having at least one heteroatom, typically a sulfur atom, the sulfur atom is optionally SO, SO 2, or SS part It may be present as a part. 가장 전형적으로는, 고리는 2개의 황 원자, 또는 하나의 황 원자에 더하여 하나의 제2의 상이한 헤테로원자, 예를 들어 산소 또는 질소를 고리 내에 포함한다. And most typically, the ring comprises two sulfur atoms, or a different heteroatoms, such as oxygen or nitrogen in a second addition to the sulfur atom in the ring. 또한, 사이클릭 알릴릭 설파이드 부분은 다수의 고리 구조를 포함할 수도 있으며, 따라서 하이브리드 단량체는 2개 이상의 사이클릭 알릴릭 설파이드 부분을 가질 수도 있다. Further, the cyclic allyl sulfide metallic part may include a plurality of ring structures, and thus the hybrid monomer may have a cyclic allyl metallic sulfide portion of two or more. 본 발명의 조성물은 산 작용기를 포함하거나 포함하지 않는 하나 이상의 에틸렌계 불포화 화합물을 또한 함유할 수도 있다. The compositions of the present invention may also contain one or more ethylenically unsaturated compounds with or without acid functionality. 유용한 에틸렌계 불포화 화합물의 예에는 아크릴산 에스테르, 메타크릴산 에스테르, 하이드록시-작용성 아크릴산 에스테르, 하이드록시-작용성 메타크릴산 에스테르, 아크릴아미드, 메타크릴아미드 및 그 조합이 포함된다. Examples of useful ethylenically unsaturated compounds include acrylic acid esters, methacrylic acid esters, hydroxy-functional include methacrylic acid esters, acrylamides, methacrylamides, and combinations thereof-functional acrylic acid esters, hydroxy. 본 조성물(예를 들어, 광중합성 조성물)은 하나 이상의 에틸렌계 불포화 기를 갖는 단량체, 올리고머 및 중합체를 포함할 수도 있는 자유 라디칼 활성 작용기들을 갖는 화합물들을 함유할 수도 있다. The compositions (e.g., photopolymerizable compositions) may also contain a compound having free radically active functional groups that may include monomers, oligomers, and polymers having one or more ethylenically unsaturated. 적합한 화합물은 적어도 하나의 에틸렌계 불포화 결합을 포함하며, 부가 중합될 수 있다. Suitable compounds may be addition polymerization, comprising at least one ethylenically unsaturated bond. 그러한 자유 라디칼 중합성 화합물들은 메틸 (메트)아크릴레이트, 에틸 아크릴레이트, 아이소프로필 메타크릴레이트, n-헥실 아크릴레이트, 스테아릴 아크릴레이트, 알릴 아크릴레이트, 글리세롤 트라이아크릴레이트, 에틸렌글리콜 다이아크릴레이트, 다이에틸렌글리콜 다이아크릴레이트, 트라이에틸렌글리콜 다이메타크릴레이트, 1,3-프로판다이올 다이(메트)아크릴레이트, 트라이메틸올프로판 트라이아크릴레이트, 1,2,4-부탄트라이올 트라이메타크릴레이트, 1,4-사이클로헥산다이올 다이아크릴레이트, 펜타에리트리톨 테트라(메트)아크릴레이트, 소르비톨 헥사아크릴레이트, 테트라하이드로푸르푸릴 (메트)아크릴레이트, 비스[1-(2-아크릴로일옥시)]-p-에톡시페닐다이메틸메탄, 비스[1-(3-아크릴로일옥시-2-하이드록시)]-p-프로폭시페닐다이메틸메탄, 에 Such free radically polymerizable compounds include methyl (meth) acrylate, ethyl acrylate, isopropyl methacrylate, n- hexyl acrylate, stearyl acrylate, allyl acrylate, glycerol triacrylate, ethylene glycol diacrylate, diethylene glycol diacrylate, triethylene glycol dimethacrylate, 1,3-propanediol di (meth) acrylate, trimethylol propane triacrylate, 1,2,4-butane triols tri-methacrylate , 1,4-cyclohexane diacrylate, pentaerythritol tetra (meth) acrylate, sorbitol (on-yloxy 2-acrylic), hexamethylene acrylate, tetrahydrofurfuryl (meth) acrylate, bis [1- ] -p- in ethoxyphenyl dimethyl methane, bis [1- (2-hydroxy-3-yloxy acrylic); - a p- propoxyphenyl dimethyl methane, 톡실화 비스페놀 A 다이(메트)아크릴레이트, 및 트리스하이드록시에틸-아이소시아누레이트 트라이메타크릴레이트와 같은 모노-, 다이- 또는 폴리-(메트)아크릴레이트류(즉, 아크릴레이트류 및 메타크릴레이트류); Polyethoxylated bisphenol A di (meth) acrylate, and tris-hydroxyethyl-isocyanurate tri methacrylate mono such as rate-, di- or poly- (meth) acrylates (i.e., acrylates and methacrylates flow rate); (메트)아크릴아미드, 메틸렌 비스-(메트)아크릴아미드, 및 다이아세톤 (메트)아크릴아미드와 같은 (메트)아크릴아미드류(즉, 아크릴아미드류 및 메타크릴아미드류); (Meth) acrylamide, methylene bis- (meth) (meth) acrylamide, and diacetone (meth) acrylamide acrylamides (i.e., acrylamides and methacrylate amides); 우레탄 (메트)아크릴레이트류; Urethane (meth) acrylate; 폴리에틸렌 글리콜의 비스-(메트)아크릴레이트류(바람직하게는, 분자량 200-500), 미국 특허 제4,652,274호 (뵈처(Boettcher) 등)에서의 것과 같은 아크릴화 단량체의 공중합성 혼합물, 미국 특허 제4,642,126호 (자도르(Zador) 등)의 것과 같은 아크릴화 올리고머, 및 미국 특허 제4,648,843호 (미트라(Mitra))에 개시된 것과 같은 폴리(에틸렌계 불포화) 카르바모일 아이소시아누레이트, 및 스티렌, 다이알릴 프탈레이트, 다이비닐 석시네이트, 다이비닐 아디페이트 및 다이비닐 프탈레이트와 같은 비닐 화합물을 포함한다. Of polyethylene glycol-bis- (meth) acrylates (preferably, molecular weight 200-500), United States Patent No. 4,652,274 (boecheo (Boettcher), etc.) copolymerizable mixtures of acrylated monomers such as those in US Patent No. 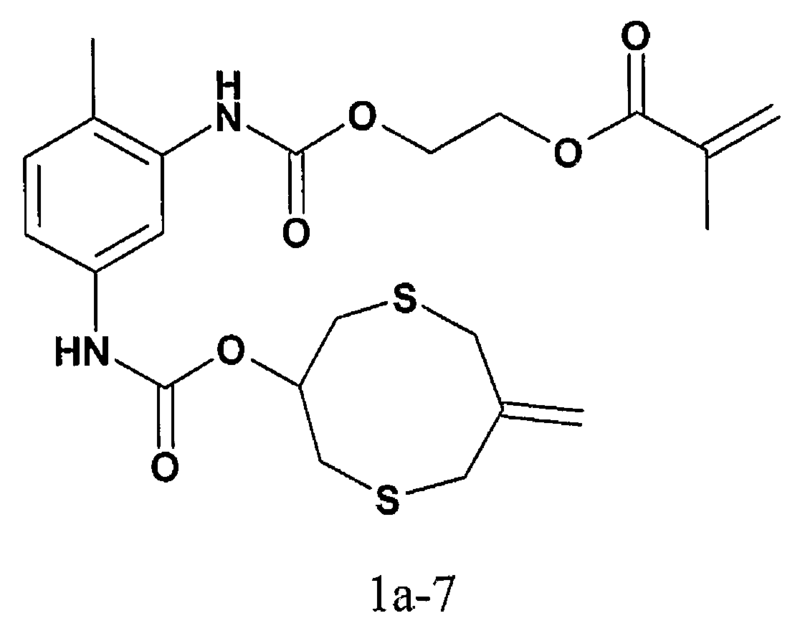 4,642,126 polyester, such as disclosed in (jadoreu (Zador), etc.) acrylated oligomer, and United States Patent 4,648,843 No. 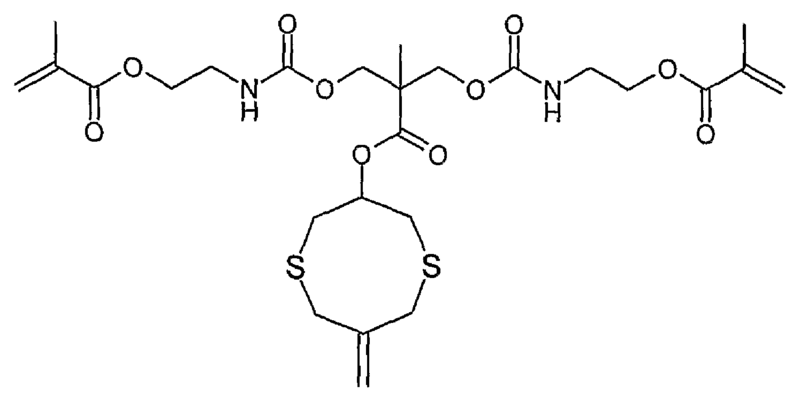 (Mitra (Mitra)), such as those of (ethylenically unsaturated) carbamoyl isocyanurate, and styrene, diallyl phthalate, die and a vinyl containing vinyl compounds such as succinate, divinyl adipate and divinyl phthalate. 다른 적합한 자유 라디칼 중합성 화합물은 예를 들어, WO 00/38619호 (구겐베르거(Guggenberger) 등), WO 01/92271호 (베인만(Weinmann) 등), WO 01/07444호 (구겐베르거 등), WO 00/42092호 (구겐베르거 등)에 개시된 실록산-작용성 (메트)아크릴레이트, 및 예를 들어, 미국 특허 제5,076,844호 (포크(Fock) 등), 미국 특허 제 4,356,296호 (그리피쓰(Griffith) 등), 유럽 특허 제0373 384호 (바겐넥트(Wagenknecht) 등), 유럽 특허 제0201 031호 (레이너스(Reiners) 등), 및 제0201 778호 (레이너스 등)에 개시된 플루오로중합체-작용성 (메트)아크릴레이트를 포함한다. Other suitable free radically polymerizable compounds include, for example, WO (such gugen Berger (Guggenberger)) No. 00/38619, WO (such as vanes only (Weinmann)) No. 01/92271, WO 01/07444 call (gugen Berger, etc.) , WO 00/42092 disclosed a number (such as gugen Berger) siloxane-functional (meth) acrylate, and, for example, U.S. Patent No. 5,076,844 (the fork (Fock), etc. ), U.S. Patent No. 4,356,296 (Su Griffey ( the fluoropolymer disclosed in Griffith), etc. ), European Patent No. 0 373 384 (VW-connect (Wagenknecht), etc. ), European Patent No. 0 201 031 No. (ray Nurse (Reiners), etc. ), and the 0201 778 call (ray bonus etc.) - and a functional (meth) acrylate. 원할 경우, 2종 이상의 자유 라디칼 중합성 화합물의 혼합물이 사용될 수 있다. If desired, a mixture of two or more free radically polymerizable compounds may be used. 에틸렌계 불포화 화합물은 또한 단일 분자 내에 하이드록실기 및 에틸렌계 불포화 기를 포함할 수도 있다. The ethylenically unsaturated compound may also comprise a hydroxyl group and an ethylenically unsaturated within a single molecule. 그러한 물질의 예에는 하이드록시알킬 (메트)아크릴레이트, 예를 들어 2-하이드록시에틸 (메트)아크릴레이트 및 2-하이드록시프로필 (메트)아크릴레이트; Examples of such materials include hydroxyalkyl (meth) acrylates such as 2-hydroxyethyl (meth) acrylate and 2-hydroxypropyl (meth) acrylate; 글리세롤 모노- 또는 다이-(메트)아크릴레이트; Glycerol mono- or di- (meth) acrylate; 트라이메틸올프로판 모노- 또는 다이-(메트)아크릴레이트; Trimethylolpropane mono- or di- (meth) acrylate; 펜타에리트리톨 모노-, 다이- 및 트라이-(메트)아크릴레이트; Pentaerythritol mono-, di- and tri- (meth) acrylate; 소르비톨 모노-, 다이-, 트라이-, 테트라- 또는 펜타-(메트)아크릴레이트; Sorbitol mono-, di-, tri-, tetra-, or penta- (meth) acrylate; 및 2,2-비스[4-(2-하이드록시-3-에타크릴옥시프로폭시)페닐]프로판 (비스GMA)이 포함된다. And is 2,2-bis [4- (2-hydroxy-3-ethacrylic oxy-propoxy) phenyl] propane containing the (bis-GMA). 적합한 에틸렌계 불포화 화합물은 또한 미국 미주리주 세인트 루인스 소재의 시그마-알드리치(Sigma-Aldrich)와 같은 매우 다양한 상업적 공급원으로부터 입수가능하다. Suitable ethylenically unsaturated compounds are also Sigma, Missouri, USA St. ruin's material - is available from a wide variety of commercial sources, such as Aldrich (Sigma-Aldrich). 원할 경우 에틸렌계 불포화 화합물들의 혼합물을 사용할 수 있다. If you want, you can use a mixture of ethylenically unsaturated compounds. 특정 실시 형태에서, 에틸렌계 불포화 화합물은 바람직하게는 치환 (메트)아크릴 화합물을 포함한다. In certain embodiments, the ethylenically unsaturated compound preferably comprises a substituted (meth) acrylic compound. 특히 유용한 (메트)아크릴 화합물은 다이(메트)아크릴레이트, 적어도 하나의 작용기를 갖는 지방족 (메트)아크릴레이트, 및 방향족 작용기를 갖는 (메트)아크릴레이트를 포함한다. Particularly useful (meth) acrylate compounds include (meth) acrylate having an aliphatic (meth) acrylate, and an aromatic functional group having a di (meth) acrylate, at least one functional group. 적합한 치환 (메트)아크릴 화합물의 예에는 미국 특허 제6,030,606호(홈즈(Holmes))에 기재된 에톡실화 비스페놀 A 다이메타크릴레이트(비스EMA6), 2-하이드록시에틸 메타크릴레이트(HEMA), 비스페놀 A 다이글리시딜 다이메타크릴레이트(비스GMA), 우레탄 다이메타크릴레이트(UDMA), 트라이에틸렌 글리콜 다이메타크릴레이트(TEGDMA), 글리세롤 다이메타크릴레이트(GDMA), 에틸렌글리콜 다이메타크릴레이트, 네오펜틸 글리콜 다이메타크릴레이트 (NPGDMA), 및 폴리에틸렌글리콜 다이메타크릴레이트(PEGDMA)가 포함된다. Suitable optionally substituted (meth) acrylic compound include examples of ethoxylated described in U.S. Patent No. 6,030,606 (Holmes (Holmes)) bisphenol A dimethacrylate (bis EMA6), 2- hydroxyethyl methacrylate (HEMA), bisphenol A diglycidyl dimethacrylate (bis-GMA), urethane dimethacrylate (UDMA), triethylene glycol dimethacrylate (TEGDMA), glycerol dimethacrylate (GDMA), glycol dimethacrylate, neopentyl pentyl glycol it includes dimethacrylate (NPGDMA), and polyethyleneglycol dimethacrylate (PEGDMA). 원할 경우 이들 화합물들의 다양한 조합을 사용할 수 있다. If you want, you can use various combinations of these compounds. 전형적으로, 본 발명의 조성물은 미충전 조성물의 총 중량을 기준으로 적어도 5 중량％, 더 전형적으로는 적어도 10 중량％, 및 가장 전형적으로는 적어도 15 중량％의 에틸렌계 불포화 화합물을 함유한다. Typically, the compositions of the present invention with non-total at least 5% by weight based on the weight of the fill composition, and more typically at least 10% by weight, and most typically contains an ethylenically unsaturated compound of at least 15% by weight. 전형적으로, 본 발명의 조성물은 미충전 조성물의 총 중량을 기준으로 최대 95 중량％, 더 전형적으로는 최대 90 중량％, 가장 전형적으로는 최대 80 중량％의 에틸렌계 불포화 화합물을 함유한다. Typically, the compositions of the present invention and the US total up to 95% by weight, based on the weight of the fill composition, more typically up to 90% by weight, most typically contains an ethylenically unsaturated compound of up to 80% by weight. 전형적으로, 본 발명의 조성물은 미충전 조성물의 총 중량을 기준으로 산 작용기를 포함하지 않는 적어도 5 중량％, 더 전형적으로는 적어도 10 중량％, 및 가장 전형적으로는 적어도 15 중량％의 에틸렌계 불포화 화합물을 함유한다. Typically, the compositions of the invention US at least 5% by weight that do not contain acid functionality, based on the total weight of the fill composition, and more typically at least 10% by weight, and most typically at least 15% by weight of ethylenically unsaturated It contains the compound. 전형적으로, 본 발명의 조성물은 미충전 조성물의 총 중량을 기준으로 산 작용기를 포함하지 않는 최대 95 중량％, 더 전형적으로는 최대 90 중량％, 가장 전형적으로 최대 80 중량％의 에틸렌계 불포화 화합물을 함유한다. Typically, the compositions of the present invention the ethylenically unsaturated compound in the US a total of up to 95% by weight that do not contain acid functionality, based on the weight of the fill composition, more typically up to 90% by weight,% up to 80 by weight, most typically It contains. 일반적으로, 본 발명의 조성물은 산 작용기를 포함하지 않는 에틸렌계 불포화 화합물을 함유하지만, 본 발명의 몇몇 실시 형태에서, 조성물은 그 대신에 또는 그 외에도 산 작용기를 포함하는 하나 이상의 에틸렌계 불포화 화합물을 함유할 수도 있다. In general, in some embodiments of the compositions of the invention containing the unsaturated compound it does not contain an acid functional group, but the present invention, the composition contains at least one ethylenically unsaturated compound containing Instead or in addition to acid functional groups it may contain. 본 명세서에 사용되는 바와 같이, 산 작용기를 포함하는 에틸렌계 불포화 화합물은 에틸렌계 불포화체 및 산 및/또는 산-전구체 작용기를 갖는 단량체, 올리고머, 및 중합체를 포함하려는 것이다. Ethylenically unsaturated compounds, containing an acid functional group as used herein is an ethylenically unsaturated material and an acid and / or acid-intended to include monomers, oligomers, and polymers having a functional group precursor. 산-전구체 작용기는 예를 들어, 언하이드라이드, 산 할라이드, 및 파이로포스페이트를 포함한다. Acid-precursor functionalities include, for example, phosphate anhydride, acid halide, and pie. 산 작용기는 C, B, P 또는 S의 옥시산 또는 그 조합을 포함할 수 있다. Acid function may include a hydroxy acid or a combination of C, B, P, or S. 예에는 카르복실산 작용기, 인산 작용기, 포스폰산 작용기, 설폰산 작용기, 또는 그 조합이 포함된다. Examples include carboxylic acid functionality, phosphoric acid functionality, phosphonic acid functionality, sulfonic acid functionality, or combinations thereof. 산 작용기를 포함하는 에틸렌계 불포화 화합물은, 예를 들어, α,β-불포화 산성 화합물, 예를 들어 글리세롤 포스페이트 모노(메트)아크릴레이트, 글리세롤 포스페이트 다이(메트)아크릴레이트, 하이드록시에틸 (메트)아크릴레이트 (예를 들어, HEMA) 포스페이트, 비스((메트)아크릴로일옥시에틸) 포스페이트, ((메트)아크릴로일옥시프로필) 포스페이트, 비스((메트)아크릴로일옥시프로필) 포스페이트, 비스((메트)아크릴로일옥시)프로필옥시 포스페이트, (메트)아크릴로일옥시헥실 포스페이트, 비스((메트)아크릴로일옥시헥실) 포스페이트, (메트)아크릴로일옥시옥틸 포스페이트, 비스((메트)아크릴로일옥시옥틸) 포스페이트, (메트)아크릴로일옥시데실 포스페이트, 비스((메트)아크릴로일옥시데실) 포스페이트, 카프로락톤 메타크릴레이트 포스페이트, 시트 Unsaturated compounds containing an acid functional group, for example, α, β- unsaturated acidic compounds such as glycerol phosphate mono (meth) acrylates, glycerol phosphate di (meth) acrylate, hydroxyethyl (meth) acrylate (e.g., HEMA) phosphates, bis ((meth) acryloyloxyethyl) phosphate, ((meth) acryloyl oxy propyl) (one oxy propyl (meth) acrylate) phosphate, bis phosphate, bis ((meth) yloxy-acryloyl) propyloxy phosphate, (meth) acryloyloxyethyl hexyl phosphate, (one oxy-hexyl (meth) acrylate) bis phosphate, (meth) oxy octyl phosphate, bis ((meth acryloyl ) acryloyloxyethyl octyl) phosphate, (meth) acryloyloxy-side chamber phosphate, bis ((meth) acryloyloxy-side chamber) phosphate, caprolactone methacrylate phosphate, sheet 르산 다이- 또는 트라이-메타크릴레이트, 폴리(메트)아크릴화 올리고말레산, 폴리(메트)아크릴화 폴리말레산, 폴리(메트)아크릴화 폴리(메트)아크릴산, 폴리(메트)아크릴화 폴리카르복실-폴리포스폰산, 폴리(메트)아크릴화 폴리클로로 폴리클로로인산, 폴리(메트)아크릴화 폴리설포네이트, 폴리(메트)아크릴화 폴리붕산 등을 포함하며, 경화성 성분 시스템에서 성분들로 사용될 수도 있다. Acid di- or tri-methacrylates, poly (meth) acrylated oligo maleic acid, poly (meth) acrylated polymaleic acid, poly (meth) acrylated poly (meth) acrylic acid, poly (meth) acrylated polycarboxylic-polyphosphonic acid, and poly (meth) acrylated poly-chloro include polychlorotrifluoroethylene acid, poly (meth) acrylated poly sulfonate, poly (meth) acrylated polycarboxylic acid or the like, may be used in the curing component system into components. 또한, (메트)아크릴산, 방향족 (메트)아크릴화 산(예를 들어, 메타크릴화 트라이멜리트산), 및 이들의 언하이드라이드와 같은 불포화 탄산의 단량체, 올리고머, 및 중합체가 사용될 수 있다. In addition, the (meth) acrylic acids, aromatic (meth) acrylated acids (e.g., methacrylic Chemistry trimellitic acid), and it is these anhydride as monomers, oligomers, and polymers of such unsaturated acid may be used. 본 발명의 바람직한 특정 조성물은 적어도 하나의 P-OH 부분을 갖는 산 작용기를 포함하는 에틸렌계 불포화 화합물을 함유한다. Certain preferred compositions of the present invention contains the ethylenically unsaturated compound containing an acid functional group having at least one P-OH portion. 이들 화합물 중 어떤 것은, 예를 들어 아이소시아나토알킬 (메트)아크릴레이트와 카르복실산 사이의 반응 생성물로서 얻어진다. Some of these compounds is, for example, is obtained as a reaction product between a child SOCCIA NATO alkyl (meth) acrylates and carboxylic acids. 산-작용기와 에틸렌계 불포화 성분 둘 모두를 갖는 이러한 유형의 추가의 화합물이 미국 특허 제4,872,936호(엔겔브렉트(Engelbrecht)) 및 미국 특허 제5,130,347호(미트라)에 기재되어 있다. Acid - there are additional compounds of this type having both a functional group and ethylenically unsaturated components are described in U.S. Patent No. 4,872,936 (Engelhard break bit (Engelbrecht)) and U.S. Patent No. 5,130,347 (Mitra). 에틸렌계 불포화 부분과 산 부분 둘 모두를 포함하는 매우 다양한 화합물들이 사용될 수 있다. Ethylenic unsaturation and acid moiety than can be used a wide variety of compounds including both. 원할 경우 그러한 화합물들의 혼합물이 사용될 수 있다. If desired, a mixture of such compounds may be used. 예를 들어, 산 작용기를 포함하는 추가의 에틸렌계 불포화 화합물은, 예를 들어 미국 특허 공개 제2004/0206932호 (아부엘리아맨(Abuelyaman) 등)에 개시된 중합성 비스포스폰산; For example, ethylenically unsaturated compounds containing an acid functional group is added, for example, U.S. Patent Publication No. 2004/0206932 call (Abu Elia top (Abuelyaman), etc.) 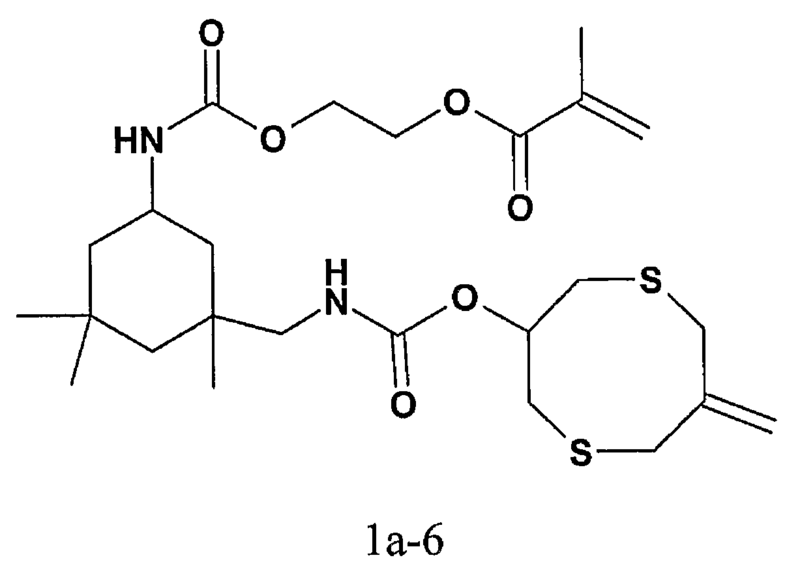 polymeric disclosed bisphosphonic acid; AA:ITA:IEM (예를 들어, 미국 특허 제5,130,347호 (미트라)의 실시예 11에 기재된 바와 같이, AA:ITA 공중합체와 충분한 2-아이소시아나토에틸 메타크릴레이트를 반응시켜 공중합체의 산 기의 일부를 펜던트 메타크릴레이트 기로 전환하여 제조된 펜던트 메타크릴레이트를 포함하는 아크릴산:이타콘산의 공중합체), 및 미국 특허 제4,259,075호 (야마우치(Yamauchi) 등), 미국 특허 제4,499,251호 (오무라(Omura) 등), 미국 특허 제4,537,940호 (오무라 등), 미국 특허 제4,539,382호 (오무라 등), 미국 특허 제5,530,038호 (야마모토(Yamamoto) 등), 미국 특허 제6,458,868호 (오카다(Okada) 등) 및 유럽 특허 출원 공개 제712,622호 (토쿠야마 코포레이션(Tokuyama Corp.)) 및 유럽 특허 출원 공개 제1,051,961호 (쿠라레이 컴퍼니, 리미티드(Kuraray Co., Ltd.))에 인용된 것들을 포함한다. AA: ITA: IEM (e.g., U.S. Patent Nos. As described in Example 11 of No. 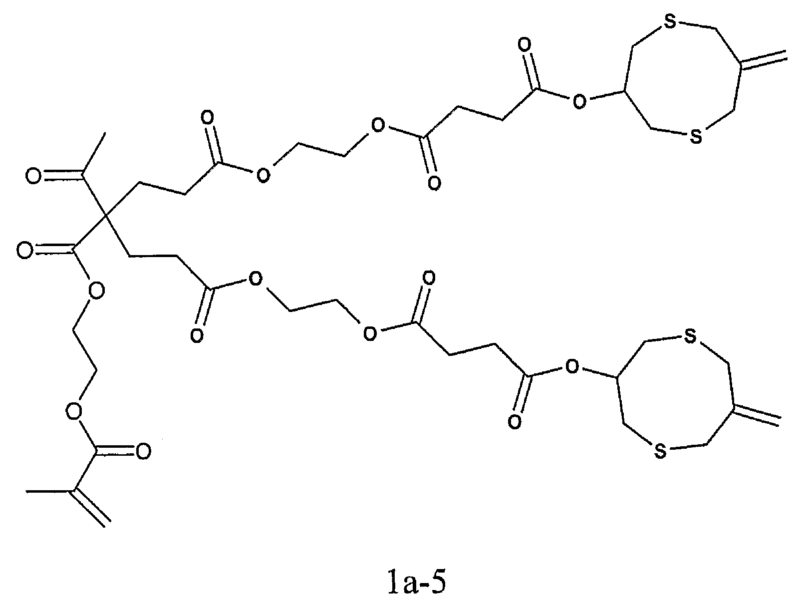 5,130,347 (Mitra), AA: ITA copolymer with sufficient of the acid by reacting the 2-child SOCCIA NATO methacrylate copolymer acrylic acid containing pendant methacrylate prepared by converting a part of the group groups pendant methacrylate: copolymers of itaconic acid), and U.S. Patent Nos. including 4,259,075 No. (Yamauchi (Yamauchi)), U.S. Patent No. 4,499,251 No. (O mura (Omura), etc. ), U.S. Patent No. 4.53794 million call (Omura, etc. ), U.S. Patent No. 4,539,382 No. (such Omura), United States Patent 5,530,038 No. (Yamamoto (Yamamoto) and the like), US Patent 6,458,868 No. (Okada ( Okada), etc.) and European Patent Application Publication No. 712 622 (Tokuyama Corp. (Tokuyama Corp.)) and European Patent Application Publication No. 1,051,961 (Kuraray Co., Ltd. (including those cited in the Kuraray Co., Ltd.)) do. 본 발명의 조성물은 또한 산 작용기를 포함하는 에틸렌계 불포화 화합물의 조합을 함유하는 조성물을 포함할 수 있다. The compositions of the present invention may also comprise a composition containing a combination of an ethylenically unsaturated compound containing an acid functional group. 전형적으로, 본 조성물은 자가-접착성(self-adhesive)이고, 비-수성이다. An aqueous-typically, the compositions self-adhesive (self-adhesive), and the ratio. 예를 들어, 그러한 조성물은 적어도 하나의 (메트)아크릴옥시 기와 적어도 하나의 OP(O)(OH) x 기 - 여기서 x는 1 또는 2이고, 적어도 하나의 OP(O)(OH) x 기 및 적어도 하나의 (메트)아크릴옥시 기는 C1-C4 탄화수소 기에 의해 함께 결합됨 - 를 포함하는 제1 화합물; For example, such compositions include at least one (meth) acryloxy group and at least one of OP (O) (OH) x group - where x is at least one OP (O) 1 or 2, (OH) x group and at least one (meth) acryloxy groups are coupled together by a C1-C4 hydrocarbon-first compound comprising; 적어도 하나의 (메트)아크릴옥시 기와 적어도 하나의 OP(O)(OH) x 기 - 여기서 x는 1 또는 2이고, 적어도 하나의 OP(O)(OH) x 기 및 적어도 하나의 (메트)아크릴옥시 기는 C5-C12 탄화수소 기에 의해 함께 결합됨 - 를 포함하는 제2 화합물; At least one (meth) acryloxy group and at least one of OP (O) (OH) x group - where x is 1 or 2 and at least one OP (O) (OH) x group and the at least one (meth) acrylate a second compound containing oxy groups are coupled together by a C5-C12 hydrocarbon group; 산 작용기를 포함하지 않는 에틸렌계 불포화 화합물; Ethylenically unsaturated compounds that do not contain an acid functional group; 개시제 시스템; An initiator system; 및 충전제를 함유할 수 있다. And it may contain fillers. 그러한 조성물이, 예를 들어, 2004년 8월 11일자로 출원된 미국 가출원 제60/600,658호 (루치터한트(Luchterhandt) 등)에 기재되어 있다. Such compositions, for example, are described in, filed 11th August 2004 US Provisional Application No. 60/600 658 No. (Luch emitter hanteu (Luchterhandt), etc.). 전형적으로, 본 발명의 조성물은 미충전 조성물의 총 중량을 기준으로, 산 작용기를 포함하는 적어도 1 중량％, 더 전형적으로는 적어도 3 중량％, 및 가장 전형적으로는 적어도 5 중량％의 에틸렌계 불포화 화합물을 함유한다. Typically, the compositions of the invention US, based on the total weight of the fill composition, at least 1% by weight containing an acid functional group, and more typically at least 3% by weight, and most typically at least 5% by weight of ethylenically unsaturated It contains the compound. 전형적으로, 본 발명의 조성물은 미충전 조성물의 총 중량을 기준으로, 산 작용기를 포함하는 최대 80 중량％, 더 전형적으로는 최대 70 중량％, 가장 전형적으로 최대 60 중량％의 에틸렌계 불포화 화합물을 함유한다. Typically, the compositions of the present invention the ethylenically unsaturated compound in the US, based on the total weight of the fill composition, up to 80% by weight containing an acid functional group, and more typically up to 70% by weight,% up to 60 by weight, most typically It contains. 특정 실시 형태에서, 본 발명의 조성물은 광중합가능하며, 즉 본 조성물은 광중합성 성분 및 화학선의 조사시 조성물의 자유 라디칼 중합(또는 경화)을 개시하는 광개시제(즉, 광개시제 시스템)를 함유한다. In certain embodiments, the compositions of the present invention can be photo-polymerization, that is the compositions contain a photoinitiator (i.e., a photoinitiator system) that initiates free radical polymerization at the time of the photopolymerizable component and the actinic irradiation composition (or cured). 자유 라디칼 광중합성 조성물의 중합에 적합한 광개시제는 전형적으로 기능성 파장 범위가 300 ㎚ 내지 1200 ㎚, 더 전형적으로는 300 ㎚ 내지 600 ㎚인 포스핀 옥사이드 부류를 포함한다. The free radical photoinitiators suitable for the polymerization of the photopolymerizable composition will typically have a functional wavelength range of 300 to 1200 ㎚ ㎚, and more typically contains a phosphine oxide class of 300 to 600 ㎚ ㎚. 특히 유용한 포스핀 옥사이드 자유 라디칼 개시제는 일반적으로 기능성 파장 범위가 380 ㎚ 내지 450 ㎚ 이며 미국 특허 제4,872,936호 (엔겔브렉트(Engelbrecht)) 및 미국 특허 제5,130,347호 (미트라)에 기재되어 있다. Especially useful phosphine oxide free radical initiators with a functional wavelength range is generally 380 to 450 ㎚ ㎚ are described in U.S. Patent No. 4,872,936 (Engelhard break bit (Engelbrecht)) and U.S. Patent No. 5,130,347 (Mitra). 미국 특허 제4,298,738호 (렉텐(Lechtken) 등), 미국 특허 제4,324,744호 (렉텐 등), 미국 특허 제4,385,109호 (렉텐 등), 미국 특허 제4,710,523호 (렉텐 등), 및 미국 특허 제4,737,593호 (엘리치(Ellrich) 등), 미국 특허 제6,251,963호 (콜러(Kohler) 등); U.S. Patent No. (such rekten (Lechtken)) 4,298,738 arc, U.S. Patent No. 4,324,744 No. (rekten, etc. ), U.S. Patent No. 4,385,109 No. (rekten, etc. ), U.S. Patent No. 4,710,523 No. (rekten the like), and United States Patent 4,737,593 No. ( elrichi (Ellrich), etc. ), U.S. Patent No. 6,251,963 (Kohler (Kohler) and the like); 및 유럽 출원 제0 173 567 A2호 (잉(Ying))에 기재된 것들과 같은 아실 및 비스아실 포스핀 옥사이드이다. And a European Application No. 0 173 567 A2 No. (Ying (Ying)) acyl, and bis-acyl phosphine oxide, such as those described. 380 ㎚ 내지 450 ㎚ 초과의 파장 범위로 조사될 때 자유-라디칼 개시가 가능한 구매가능한 포스핀 옥사이드 광개시제는 비스(2,4,6-트라이메틸벤조일)페닐 포스핀 옥사이드 (이르가큐어(IRGACURE) 819, 미국 뉴욕주 태리타운 소재의 시바 스페셜티 케미컬즈(Ciba Specialty Chemicals)), 비스(2,6-다이메톡시벤조일)-(2,4,4-트라이메틸펜틸)포스핀 옥사이드(CGI 403, 시바 스페셜티 케미컬즈), 비스(2,6-다이메톡시벤조일)-2,4,4-트라이메틸펜틸 포스핀 옥사이드와 2-하이드록시-2-메틸-1-페닐프로판-1-온의 중량 기준으로 25:75의 혼합물 (이르가큐어 1700, 시바 스페셜티 케미컬즈), 비스(.eta.5-2-4-사이클로펜타다이엔-1-일)-비스(2,6-다이플루오로-3-(1H-피롤-1-일)-페닐)티타늄(이르가큐어 784, 시바 스페셜티 케미컬즈), 비스(2,4,6-트라이메틸벤조일)페닐 포스핀 옥사이드와 2-하이드록시-2- When irradiated with 380 to 450 ㎚ ㎚ than the wavelength range of the free-purchase phosphine oxide photoinitiator available a radical initiator available include bis (2,4,6-trimethylbenzoyl) phenyl phosphine oxide (IRGACURE (IRGACURE) 819 , Ciba Specialty Chemical's (Ciba Specialty Chemicals) in Tarrytown, New York material), bis (2,6-dimethoxy benzoyl) - (2,4,4-trimethyl-pentyl) phosphine oxide (CGI 403, Ciba based on the weight of the Specialty Chemicals's), bis (2,6-methoxybenzoyl) -2,4,4- trimethyl-pentyl phosphine oxide and 2-hydroxy-2-methyl-1-phenylpropan-1-one a mixture of 25: 75 (Irgacure 1700, Ciba Specialty Chemical's), bis (.eta.5-2-4- cyclopentadienyl-1-yl) -bis (2,6-fluoro-3 - (1H- pyrrol-1-yl) -phenyl) titanium (IRGACURE 784, Ciba Specialty Chemical's), bis (2,4,6-trimethylbenzoyl) phenyl phosphine oxide and 2-hydroxy-2 틸-1-페닐프로판-1-온의 중량 기준으로 1:1의 혼합물 (다로커(DAROCUR) 4265, 시바 스페셜티 케미컬즈), 및 에틸 2,4,6-트라이메틸벤질페닐 포스피네이트(루시린(LUCIRIN) LR8893X, 미국 노쓰 캐롤라이나 샬로트 소재의 바스프 코포레이션(BASF Corp.))를 포함한다. Butyl-1-phenylpropan-1-one based on the weight of the whole mixture of 1 (the rocker (DAROCUR) 4265, Ciba Specialty Chemical's), and ethyl 2,4,6-trimethyl-benzyl-phenyl-phosphinate (Lucy It includes lean (LUCIRIN) LR8893X, BASF Corporation (BASF Corp.) in the United States of America North Carolina Charlotte material). 3차 아민 환원제를 아실포스핀 옥사이드와 조합하여 사용할 수도 있다. A tertiary amine reducing agents may be used in combination with an acylphosphine oxide. 본 발명에 유용한 예시적 3차 아민에는 에틸 4-(N,N-다이메틸아미노)벤조에이트 및 N,N-다이메틸아미노에틸 메타크릴레이트가 포함된다. 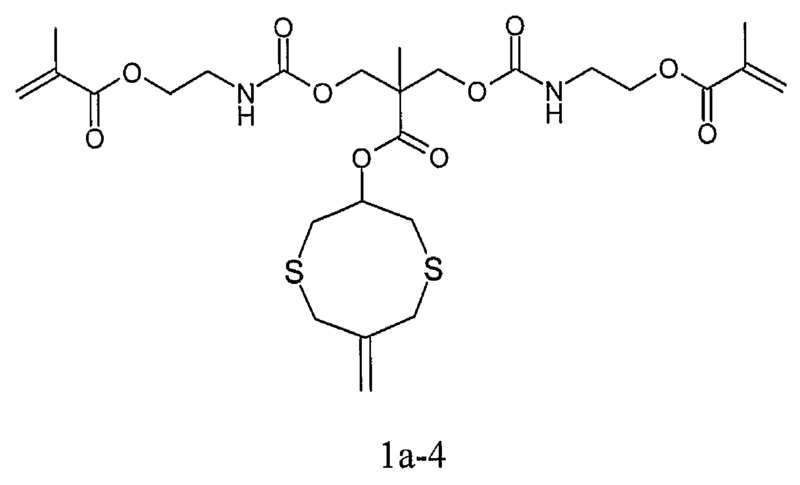 Exemplary tertiary amines useful in the invention include ethyl 4- (N, N- dimethylamino) benzoate and N, N- dimethyl aminoethyl methacrylate. 존재할 때, 아민 환원제는 조성물의 총 중량을 기준으로 광중합성 조성물 중에 0.1 중량％ 내지 5.0 중량％의 양으로 존재한다. When present, the amine reducing agent is present in an amount of 0.1% to 5.0% by weight of the photopolymerizable composition relative to the total weight of the composition. 다른 개시제의 유용한 양은 당업자에게 잘 알려져 있다. Useful amounts of other initiators are well known to those skilled in the art. 자유 라디칼 광중합성 조성물의 중합에 적합한 다른 광개시제(즉, 하나 이상의 화합물을 포함하는 광개시제 시스템)은 2성분 시스템 및 3성분 시스템을 포함한다. Other photoinitiators suitable for free radical polymerization of the photopolymerizable composition (i.e., photoinitiator systems that include one or more compounds) comprises a two-component system and three component system. 전형적인 3성분 광개시제 시스템은 미국 특허 제5,545,676호 (팔라조토(Palazzotto) 등)에 기재된 바와 같이 아이오도늄염, 감광제, 및 전자 공여 화합물을 포함한다. Typical three-component photoinitiator system comprises an iodo salt, sensitizer, and electron donor compound, as described in U.S. Patent No. 5,545,676 (Palazzo Giotto (Palazzotto), etc.). 바람직한 아이오도늄염은 다이아릴 아이오도늄염, 예를 들어 다이페닐아이오도늄 클로라이드, 다이페닐아이오도늄 헥사플루오로포스페이트, 다이페닐아이오도늄 테트라플루오로보레이트, 및 톨릴쿠밀아이오도늄 테트라키스(펜타플루오로페닐)보레이트이다. Preferred iodo salts are diaryl-iodo salt, for example, diphenyl-iodo chloride, diphenyl iodo iodonium hexafluorophosphate, diphenyl-iodo also borates, and tolyl cumyl Iowa as iodonium tetrafluoroborate tetrakis ( a pentafluorophenyl) borate. 바람직한 감광제는 400 ㎚ 내지 520 ㎚ (바람직하게, 450 ㎚ 내지 500 ㎚) 범위 내의 일부 광을 흡수하는 모노케톤 및 다이케톤이다. A preferred photosensitizer is a mono-ketones, and diketones that absorb some light within a 400 ㎚ ㎚ to 520 (preferably, 450 to 500 ㎚ ㎚) range. 더욱 바람직한 화합물은 400 ㎚ 내지 520 ㎚ (더욱 더 바람직하게는, 450 ㎚ 내지 500 ㎚) 범위 내의 일부 광을 흡수하는 알파 다이케톤이다. More preferred compounds are alpha diketones that absorb some light within a 400 ㎚ ㎚ to 520 (more preferably, 450 to 500 ㎚ ㎚) range. 바람직한 화합물은 캄포르퀴논, 벤질, 푸릴, 3,3,6,6-테트라메틸사이클로헥산다이온, 펜안트라퀴논, 1-페닐-1,2-프로판다이온 및 다른 1-아릴-2-알킬-1,2-에탄다이온, 및 사이클릭 알파 다이케톤이다. Preferred compounds are camphorquinone, benzyl, furyl, 3,3,6,6- tetramethyl-cyclohexane-dione, pen anthraquinone, 1-phenyl-1,2-Pro Panda ions and other 1-aryl-2-alkyl ethane-1,2-dione, and a cyclic alpha diketones. 캄포르퀴논이 가장 바람직하다. Camphorquinone is the most preferred. 바람직한 전자 공여 화합물은 치환된 아민, 예를 들어, 에틸 다이메틸아미노벤조에이트를 포함한다. Preferred electron donor compounds include substituted amines, e.g., ethyl-dimethyl-aminobenzoate. 양이온 중합성 수지의 광중합에 유용한 다른 적합한 3성분 광개시제 시스템이, 예를 들어, 미국 특허 제6,765,036호(데데(Dede) 등)에 기재되어 있다. It is described in the cationic polymerizable resins useful photopolymerization Other suitable third component in the photoinitiator system of, for example, (such as Dedeman (Dede)) US Patent No. 6,765,036. 또 다른 적합한 개시제 시스템은 발명의 명칭이 "중합 수축성이 적은 경화성 치과용 조성물(Hardenable Dental Compositions with Low Polymerization Shrinkage)"인 공히 계류 중인 미국 가출원 제60/679265호에 기재되어 있다. Another suitable initiator systems are described in the title "polymerization shrinkability is less curable dental composition (Hardenable Dental Compositions with Low Polymerization Shrinkage)" of the invention in both co-pending U.S. Provisional Application No. 60/679265 call. 본 발명의 조성물은 조성물의 총 중량을 기준으로 전형적으로 적어도 0.03 중량％, 더 전형적으로는 적어도 0.08 중량％, 더욱 더 전형적으로는 적어도 0.12 중량％, 가장 전형적으로는 적어도 0.18 중량％의 감광제를 함유한다. The compositions of the present invention is typically at least 0.03% by weight based on the total weight of the composition, and more typically at least 0.08% by weight, and even more typically at least 0.12% by weight, and most typically contains a sensitizer of at least 0.18% by weight do. 광개시제 시스템은 원하는 속도의 경화(예를 들어, 중합 및/또는 가교 결합)를 제공하기에 충분한 양으로 존재한다. Photoinitiator system is present in an amount sufficient to provide the desired rate of hardening (e.g., polymerizing and / or crosslinking). 조성물 중의 광개시제 시스템 성분들의 양은 광원, 방사 에너지에 노출되는 층의 두께, 및 성분(들)의 소광 계수에 부분적으로 의존적일 것이다. It will be in the extinction coefficient of the thickness of the layer to be exposed to the amount of the light source, the radiation energy of the photoinitiator system components in the composition, and component (s) in part, dependent. 몇몇 실시 형태에서, 본 발명의 조성물은 화학적으로 경화가능하며, 즉 본 조성물은 화학적으로 경화가능한 성분과, 화학선 조사에 의존하지 않고 조성물을 중합, 큐어링, 또는 이와 달리 경화할 수 있는 화학 개시제(즉, 개시제 시스템)를 함유한다. In some embodiments, the compositions of the present invention is chemically stiffened, i.e. the compositions polymerize the composition without resorting to chemically curable component and actinic radiation, curing, or otherwise chemical initiator that can cure contains a (i.e., initiator system). 그러한 화학적 경화성 조성물은 때로 "자가-경화"조성물로 지칭되며 유리 이오노머 시멘트, 수지-변형된 유리 이오노머 시멘트, 산화환원 경화 시스템, 및 이들의 조합을 함유할 수도 있다. Such chemically hardenable compositions are sometimes "self-curing" is referred to as glass ionomer cement composition, the resin - may contain a modified glass ionomer cements, redox cure systems, and combinations thereof. 화학적 경화성 조성물은 경화성 성분(예를 들어, 에틸렌계 불포화 중합성 성분) 및 산화제와 환원제를 포함하는 산화환원 제제(agent)를 포함하는 산화환원 경화 시스템을 함유할 수도 있다. Chemical curing composition may also contain a redox cure system including a redox agent (agent) containing a curing component (e.g., an ethylenically unsaturated polymerizable component) and the oxidizing and reducing agents. 본 발명에 유용한 적합한 경화성 성분, 산화환원 제제, 선택적인 산-작용성 성분 및 선택적 충전제가 미국 특허 제5,154,762호 (미트라 등) 및 미국 특허 공개 제2003/0166740호 (미트라 등) 및 미국 특허 공개 제2003/0195273호 (미트라 등)에 기재되어 있다. Suitable curable components useful in the present invention, the oxidation-reduction agent, an optional acid-functional component and optional filler is U.S. Patent No. 5,154,762 (Mitra, etc. ), and U.S. Patent Publication No. 2003/0166740 call (Mithras, etc. ), and U.S. Patent Publication No. It is described in No. 2003/0195273 (Mitra, etc.). 환원제 및 산화제는 서로 반응하거나 이와 달리 함께 작용하여 수지 시스템(예를 들어, 에틸렌계 불포화 성분)의 중합을 개시할 수 있는 자유-라디칼을 생성하여야 한다. Reducing agent and oxidizing agent is free to initiate polymerization of the resin system (e.g., the ethylenically unsaturated component) in response to, or otherwise interacting with each other this way - to be produce radicals. 이러한 유형의 경화는 암반응이며, 즉 광의 존재에 의존적이지 않으며 광의 부재 하에 진행될 수 있다. This type of cure is a ambaneung, that can be carried out under the absence of light does not depend on the presence of light. 환원제와 산화제는 전형적인 치과적 조건 하에서 보관 및 사용을 가능하게 하기 위하여 충분한 저장-안정성이 있으며 바람직하지 않은 착색이 없는 것이 바람직하다. Reducing agent and oxidizing agent is sufficient storage to allow the storage and use under typical dental conditions, it is preferred that no non-coloring and the stability desired. 이들은 경화성 조성물의 다른 성분들 중에 즉각적으로 용해가 가능하도록 (그리고, 분리되지 않도록), 수지 시스템과 충분히 혼화가능하여야 한다 (그리고, 바람직하게는 수용성이어야 함). These immediate (and prevent, remove) the dissolution is to enable the other components of the curable composition, the resin system and should be sufficiently miscible (and, must be preferably water-soluble). 유용한 환원제는 미국 특허 제5,501,727호 (왕(Wang) 등)에 기재된 아스코르브산, 아스코르브산 유도체 및 금속 착화된 아스코르브산 화합물, 아민, 특히 3차 아민, 예를 들어 4-tert-부틸 다이메틸아닐린 및 N,N-비스(하이드록시에틸)-p-톨루이딘; Useful reducing agents include U.S. Patent No. 5,501,727 (Wang (Wang), and so on) of ascorbic acid, ascorbic acid derivatives, and metal complexed ascorbic acid compounds as described in the amines, in particular tertiary amines, for example 4-tert- butyl-dimethyl-aniline and N, N- bis (hydroxyethyl) -p- toluidine; 방향족 설피닉 염, 예를 들어 p-톨루엔설피닉 염 및 벤젠설피닉 염; Aromatic sulfinyl Nick salts, such as p- toluene sulfinyl and benzene sulfinyl Nic Nic salt salt; 1-에틸-2-티오우레아, 테트라에틸 티오우레아, 테트라메틸 티오우레아, 1,1-다이부틸 티오우레아 및 1,3-다이부틸 티오우레아와 같은 티오우레아; Thioureas, such as 1-ethyl-2-thiourea, tetraethyl thiourea, tetramethyl thiourea, 1,1-dibutyl thiourea, and 1,3- dibutyl thiourea; 및 이들의 혼합물을 포함한다. And mixtures thereof. 다른 2차 환원제는 염화코발트(II), 염화제1철, 황산제1철, 하이드라진, 하이드록실아민 (선택된 산화제에 따라서), 다이티오나이트 또는 설파이트 음이온의 염, 및 이들의 혼합물을 포함할 수도 있다. Other secondary reducing agents may include cobalt chloride (II), ferrous chloride, ferrous sulfate, hydrazine, hydroxylamine (depending on the selected oxidizing agent), di-thio nitro or sulfonic salt of a sulfite anion, and mixtures thereof may. 바람직하게는, 환원제는 아민이다. Preferably, the reducing agent is an amine. 적합한 산화제가 또한 당업자에게 잘 알려져 있을 것이며, 이는 과황산 및 그 염, 예를 들어 나트륨, 칼륨, 암모늄, 세슘 및 알킬 암모늄 염을 포함하지만, 이로 한정되는 것은 아니다. Suitable oxidizing agents will also be well known to those skilled in the art, that the sulfuric acid and its salts, such as sodium, potassium, ammonium, cesium, and alkyl ammonium salt, but is not limited thereto. 추가의 산화제는 퍼옥사이드, 예를 들어 벤조일 퍼옥사이드, 하이드로퍼옥사이드, 예를 들어 쿠밀 하이드로퍼옥사이드, t-부틸 하이드로퍼옥사이드, 및 아밀 하이드로퍼옥사이드와, 전이 금속의 염, 예를 들어 염화코발트 (III) 및 염화제2철, 황산세륨 (IV), 과붕산 및 그 염, 과망간산 및 그 염, 과인산 및 그 염과 이들의 혼합물을 포함한다. Additional oxidizing agents include peroxides, such as benzoyl peroxides, hydroperoxides, for example cumyl hydroperoxide, t- butyl hydroperoxide, and amyl hydroperoxide, and a salt of a transition metal, such as cobalt chloride (III) chloride and include ferric sulfate, cerium (IV), and boric acid and salts thereof, permanganic acid and salts thereof, superphosphate and their salts and mixtures thereof. 하나 초과의 산화제 또는 하나 초과의 환원제를 사용하는 것이 바람직할 수도 있다. It may be preferable to use a reducing agent of an oxidizing agent or more than one than one. 또한, 소량의 전이 금속 화합물을 첨가하여 산화환원 경화의 속도를 빠르게 할 수도 있다. Furthermore, the addition of a small amount of transition metal compound can also speed up the reduction oxidation curing. 몇몇 실시 형태에서, 미국 특허 공개 제2003/0195273호 (미트라 등)에 기재된 것과 같이 중합성 조성물의 안정성이 향상되도록 2차 이온 염을 포함하는 것이 바람직할 수도 있다. In some embodiments, the US patent publication to improve the stability of the polymerizable composition as described in No. 2003/0195273 (Mitra, etc.) it may be desirable to include a secondary ionic salt. 환원제 및 산화제는 적당한 자유-라디칼 반응 속도를 가능하게 하기에 충분한 양으로 존재한다. A reducing agent and an oxidizing agent is suitable free-present in an amount sufficient to allow the radical reaction rate. 이는 선택적인 충전제를 제외한 경화성 조성물의 모든 성분들을 조합하고, 경화된 덩어리가 얻어지는지 아닌지를 관찰하여 평가할 수 있다. This can be evaluated by observing whether or not a combination of the components of the hardenable composition except for the optional filler, and the resulting cured mass. 전형적으로, 환원제는 경화성 조성물의 성분들의 총 중량 (물 포함)을 기준으로, 적어도 0.01 중량％, 더 전형적으로는 적어도 0.1 중량％의 양으로 존재한다. Typically, the reducing agent is in, based on the total weight (including water) of the components of the curable composition, at least 0.01% by weight, and more typically is present in an amount of at least 0.1% by weight. 전형적으로, 환원제는 경화성 조성물의 성분들의 총 중량 (물 포함)을 기준으로, 10 중량％ 이하, 더 전형적으로는 5 중량％ 이하의 양으로 존재한다. Typically, the reducing agent is, based on the total weight (including water) of the components of the curable composition, of 10 wt% or less, and more typically is present in an amount of up to 5% by weight. 전형적으로, 산화제는 경화성 조성물의 성분들의 총 중량 (물 포함)을 기준으로, 적어도 0.01 중량％, 전형적으로는 적어도 0.10 중량％의 양으로 존재한다. Typically, the oxidizing agent based on the total weight (including water) of the components of the curable composition, at least 0.01% by weight, typically present in an amount of at least 0.10% by weight. 전형적으로, 산화제는 경화성 조성물의 성분들의 총 중량 (물 포함)을 기준으로, 10 중량％ 이하, 더 전형적으로는 5 중량％ 이하의 양으로 존재한다. Typically, the oxidizing agent based on the total weight (including water) of the components of the curable composition, of 10 wt% or less, and more typically is present in an amount of up to 5% by weight. 환원제 또는 산화제는 미국 특허 제5,154,762호 (미트라 등)에 기재된 것과 같이 마이크로캡슐화할 수 있다. Reducing agent or the oxidizing agent can be microencapsulated as described in (such as Mitra) U.S. Patent No. 5,154,762. 이것에 의해 경화성 조성물의 저장 안정성이 일반적으로 향상될 것이며, 필요할 경우 환원제 및 산화제를 함께 포장하는 것이 가능해질 것이다. This in the storage stability of the curable composition will be generally improved by, it will become possible to pack the reducing agent and oxidizing agent together if necessary. 예를 들어, 캡슐화제(encapsulant)를 적절하게 선택함으로써, 산화제 및 환원제를 산-작용성 성분 및 선택적인 충전제와 조합할 수 있고 보관-안정 상태에서 유지할 수 있다. For example, by appropriately selecting the encapsulant (encapsulant), the acid oxidizing agent and reducing agent - it can be combined with the functional component and optional filler store - can be maintained in a stable state. 산화환원 경화 시스템은 다른 경화 시스템, 예를 들어, 미국 특허 제5,154,762호 (미트라 등)에 기재된 것과 같은 경화성 조성물과 조합할 수 있다. The redox cure system can be combined with the curable compositions, such as those described in other cure systems, for example, (such as Mitra) U.S. Patent No. 5,154,762. 본 발명의 조성물은 또한 충전제를 함유할 수 있다. The compositions of the present invention may also contain a filler. 충전제는 치과적 수복용 조성물 등에 현재 사용되고 있는 충전제와 같은, 치과적 용도에 사용되는 조성물에 혼입하기에 적합한 하나 이상의 매우 다양한 물질들로부터 선택될 수도 있다. Fillers may be selected from one or more of a wide variety of materials suitable for incorporation in compositions used for the same, dental applications and currently in use in such dental fillers can coating composition. 충전제는 바람직하게는 미분화된다. Filler is preferably micronized. 충전제는 단일모드 또는 다중모드 (예를 들어, 이중모드) 입자 크기 분포를 가질 수 있다. The filler may have a single mode or multi-mode (e.g., a dual mode), the particle size distribution. 전형적으로, 충전제의 최대 입자 크기(입자의 최대 치수, 전형적으로, 직경)는 20 마이크로미터 미만이며, 더 전형적으로는 10 마이크로미터 미만, 가장 전형적으로는 5 마이크로미터 미만이다. Typically, the maximum particle size of the filler (the largest dimension of a particle, typically, the diameter) is less than 20 micrometers, and more typically less than 10 microns, most typically less than 5 microns. 전형적으로, 충전제의 평균 입자 크기는 0.4 마이크로미터 미만, 더 전형적으로는 0.1 마이크로미터 미만, 가장 전형적으로는 0.075 마이크로미터 미만이다. Typically, the average particle size of the filler is less than 0.4 micrometers, and more typically less than 0.1 microns, most typically less than 0.075 micrometer. 충전제는 무기 물질일 수 있다. The filler may be an inorganic material. 충전제는 또한 수지 시스템(즉, 경화성 성분)에 불용성인 가교 결합된 유기 물질일 수 있고, 선택적으로 무기 충전제로 충전된다. The filler also may be in the resin system of water-insoluble cross-linked organic material (that is, curing component), and is optionally filled with an inorganic filler. 충전제는 어떤 경우에도 무독성이어야 하며 구강 내에서 사용하기에 적합하여야 한다. The filler must be non-toxic in any case and should be suitable for use in the oral cavity. 충전제는 방사선 불투과성이거나 방사선 투과성일 수 있다. The filler may be a radiopaque or radiolucent. 충전제는 전형적으로 물에 실질적으로 불용성이다. The filler is typically substantially insoluble in water. 적합한 무기 충전제의 예로는, 석영(즉, 실리카, SiO 2 ); Examples of suitable inorganic fillers are quartz (i.e., silica, SiO 2); 질화물(예를 들어, 질화규소); Nitrides (e.g., silicon nitride); 예를 들어, Zr, Sr, Ce, Sb, Sn, Ba, Zn 및 Al로부터 유도된 유리 및 충전제; For example, a glass and filler, derived from Zr, Sr, Ce, Sb, Sn, Ba, Zn and Al; 장석; feldspar; 보로실리케이트 유리; Borosilicate glass; 고령토; china clay; 활석; talc; 지르코니아; Zirconia; 티타니아; Titania; 미국 특허 제4,695,251호 (란드클레브(Randklev))에 기재된 것과 같은 낮은 모스 (Mohs) 경도의 충전제; Low Mohs (Mohs) hardness fillers such as those described in U.S. Patent No. 4,695,251 (Strand Cleve (Randklev)); 및 서브미크론의 실리카 입자(예를 들어, 미국 오하이오주 아크론 소재의 데구사 코포레이션(Degussa Corp.)으로부터의 "OX 50", "130", "150" 및 "200" 실리카를 포함하는, 상표명 에어로실(AEROSIL)로 입수가능한 것 및 미국 일리노이주 투스콜라 소재의 캐보트 코포레이션(Cabot Corp.)으로부터의 CAB-O-SIL M5 실리카와 같은 발열성 실리카)를 포함하지만 이로 한정되는 것은 아닌 천연 또는 합성 물질이다. And silica particles of sub-micron (e. G., United States from speaking Corporation (Degussa Corp.) having a Akron, Ohio material "OX 50", "130",, trade name Aero comprising silica "150" and "200" It would be possible to obtain a chamber (AEROSIL) and Illinois tooth coke Cabot Corporation of which include but are not limited to non-natural or synthetic CAB-O-SIL M5 silica, such as pyrogenic silica) from (Cabot Corp.) in the material a material. 적합한 유기 충전제 입자의 예에는 충전된 또는 미충전된 분쇄된 폴리카르보네이트, 폴리에폭사이드 등이 포함된다. Examples of suitable organic filler particles include a charge of or unfilled pulverized polycarbonates, width of the polycide or the like. 적합한 비-산-반응성 충전제 입자는 석영(즉, 실리카), 서브미크론의 실리카, 지르코니아, 서브미크론의 지르코니아 및 미국 특허 제4,503,169호 (란드클레브(Randklev))에 기재된 유형의 비-유리질 마이크로입자이다. Suitable non-acid-reactive filler particles are quartz (i.e., silica), of the type described in the zirconia, and U.S. Patent No. 4,503,169 No. (Rheinland Cleve (Randklev)) of submicron silica, zirconia, submicron non-vitreous microparticles to be. 이들 비-산-반응성 충전제의 혼합물과, 유기 및 무기 물질로부터 제조된 조합형 충전제가 또한 고려된다. These non-acid - a combination fillers made from a mixture of the reactive filler, and organic and inorganic materials is also contemplated. 충전제는 또한 산-반응성 충전제일 수 있다. The filler also acid - may be a reactive charge. 적합한 산-반응성 충전제는 금속 산화물, 유리, 및 금속염을 포함한다. Suitable acid-reactive fillers include metal oxides, glasses, and metal salts. 전형적인 금속 산화물은 산화바륨, 산화칼슘, 산화마그네슘, 및 산화아연을 포함한다. Typical metal oxides include barium oxide, calcium oxide, magnesium oxide, and zinc oxide. 전형적인 유리는 보레이트 유리, 포스페이트 유리, 및 플루오로알루미노실리케이트("FAS") 유리를 포함한다. Typical glass includes aluminosilicate ( "FAS") glass as a borate glass, a phosphate glass, and fluoro. FAS 유리가 특히 바람직하다. The FAS glasses are particularly preferred. FAS 유리는, 유리가 경화성 조성물의 성분들과 혼합될 때 경화된 치과용 조성물이 형성되도록 전형적으로 충분한 용출성 양이온을 포함한다. FAS glass, and typically include sufficient eluting cations such that the glass is for the cured dental composition is formed when mixed with the components of the curable composition. 경화된 조성물이 우식 억제 특성을 가지도록 유리는 또한 전형적으로 충분한 용출성 플루오라이드 이온을 포함한다. So that the cured composition have a caries inhibiting properties of glass also typically it contains sufficient eluting fluoride ion. 유리는 FAS 유리 제조 업계의 숙련자에게 잘 알려진 기술을 사용하여 플루오라이드, 알루미나, 및 다른 유리-형성 성분들을 함유하는 용융물로부터 제조할 수 있다. Glass using techniques well known to those skilled in the FAS glass manufacturing industry fluoride, alumina, and other glass-can be prepared from the melt containing the components for forming. FAS 유리는 전형적으로 충분하게 미분화된 입자 형태여서, 다른 시멘트 성분과 편리하게 혼합될 수 있고, 생성된 혼합물은 구강에서 사용될 때 잘 작용할 것이다. FAS glass typically yeoseo a sufficiently micronized particle form, may conveniently be mixed with the other cement components, the resulting mixture will work well when used in the oral cavity. 일반적으로, FAS 유리의 평균 입자 크기(전형적으로, 직경)는, 예를 들어 침강 분석기를 사용하여 측정할 때 12 마이크로미터 이하, 전형적으로는 10 마이크로미터 이하, 보다 전형적으로는 5 마이크로미터 이하이다. In general, FAS average particle size of the glass (typically, diameter) is, for example, a 12 micrometer or less, typically is typically more than 10 micrometers, as measured using a sedimentation analyzer is less than 5 micrometers . 적합한 FAS 유리는 당업자에게 잘 알려져 있을 것이고, 매우 다양한 상업적인 공급원으로부터 입수가능하며, 다수가 상표명 비트리머(VITREMER), 비트리본드(VITREBOND), 릴라이 엑스 루팅 시멘트(RELY X LUTING CEMENT), 릴라이 엑스 루팅 플러스 시멘트(RELY X LUTING PLUS CEMENT), 포탁-필 퀵(PHOTAC-FIL QUICK), 케탁-몰라르(KETAC-MOLAR), 및 케탁-필 플러스(KETAC-FIL PLUS) (미국 미네소타주 세인트 폴 소재의 쓰리엠 이에스피이 덴탈 프로덕츠(3M ESPE Dental Products)), 후지(FUJI) II LC 및 후지 IX (일본 도꾜 소재의 지-씨 덴탈 인더스트리얼 코포레이션(GC Dental Industrial Corp.)) 및 켐필 슈피리어(CHEMFIL Superior) (미국 펜실배니아주 요크 소재의 덴트스플라이 인터내셔널(Dentsply International))로 구매가능한 것과 같은 현재 구할 수 있는 유리 이오노머 시멘트에서 발견된다. Suitable FAS glasses will be well known to those skilled in the art, and available from a wide variety of commercial sources, many are trade names non trimmer (VITREMER), bit ribbon de (VITREBOND), rilrayi X routing cement (RELY X LUTING CEMENT), rilrayi X rooted Plus cement (RELY X LUTING PLUS cEMENT), potak - Phil quick (PHOTAC-FIL QUICK), ketak - I do not know Le (KETAC-MOLAR), and ketak - Phil Plus (KETAC-FIL PLUS) (of Minnesota St. Paul, the seupiyi 3M Dental Products (3M ESPE Dental Products)), Fuji (FUJI) II LC and Fuji IX (whether in Tokyo, Japan material - Mr. Dental Industrial Corp. (GC Dental Industrial Corp.)) and kempil Superior (CHEMFIL Superior) It is found in currently available glass ionomer cement as possible to buy (US PENNSYLVANIA dent splicer International (Dentsply International) very yoke material). 원할 경우, 충전제들의 혼합물을 사용할 수 있다. If you prefer, you can use a mixture of fillers. 충전제와 수지 사이의 결합을 향상시기키 위하여, 충전제 입자의 표면을 또한 커플링제로 처리할 수 있다. To improve the bond between the filler and the resin key time, the surface of the filler particles can also be treated with a coupling. 본 발명의 단량체와 공중합가능한 기를 포함하는 임의의 커플링제가 적합하다. I Any of the coupling comprising a monomer copolymerizable with the present invention is suitable. 커플링제는 선택적으로 사이클릭 알릴릭 설파이드 단위를 포함할 수 있다. The coupling agent may optionally contain a cyclic allyl sulfide Rick units. 적합한 커플링제의 사용은 감마-메타크릴옥시프로필트라이메톡시실란, 감마-메르캅토프로필트라이에톡시실란, 감마-아미노프로필트라이메톡시실란 등을 포함한다. The use of a suitable coupling agent is gamma-aminopropyl, and the like trimethoxy silane-methacryloxypropyl-trimethoxy silane, gamma-mercaptopropyl tri-ethoxy silane, gamma. 실란-처리된 지르코니아-실리카(ZrO 2 -SiO 2 ) 충전제, 실란-처리된 실리카 충전제, 실란-처리된 지르코니아 충전제 및 이들의 조합이 특정 실시 형태에서 특히 바람직하다. Silane-treated zirconia-is the treated zirconia filler, and combinations thereof, particularly preferred in a specific embodiment of silica (ZrO 2 -SiO 2) filler, silane-treated silica filler, silane. 다른 적합한 충전제가 미국 특허 제6,387,981호 (창(Zhang) 등) 및 미국 특허 제6,572,693호 (우(Wu) 등)와, 국제특허공개 WO 01/30305호 (창 등), 국제특허공개 WO 01/30306호 (윈디쉬(Windisch) 등), 국제특허공개 WO 01/30307호 (창 등), 및 국제특허공개 WO 03/063804호 (우 등)에 개시되어 있다. Other suitable fillers U.S. Patent No. 6,387,981 (Ge (Zhang), etc. ), and United States Patent No. 6,572,693 (Wu (Wu), etc.) and, International Patent Publication No. WO 01/30305 (windows, etc. ), International Patent Publication WO 01 / No. 30 306 (sh Windy (Windisch), etc. ), International Patent Publication No. WO 01/30307 (windows, etc. ), and International Patent Publication No. WO 03/063804 discloses the (R, etc.). 이들 참고 문헌에 기재된 충전제 성분들은 비응집 나노크기 실리카 입자, 비응집 나노크기 금속 산화물 입자, 나노크기 입자의 클러스터, 및 그 조합을 포함한다. Filler components described in these references include non-aggregated nanosized silica particles, non-aggregated nanosized metal oxide particles, clusters of nanosized particles, and combinations thereof. 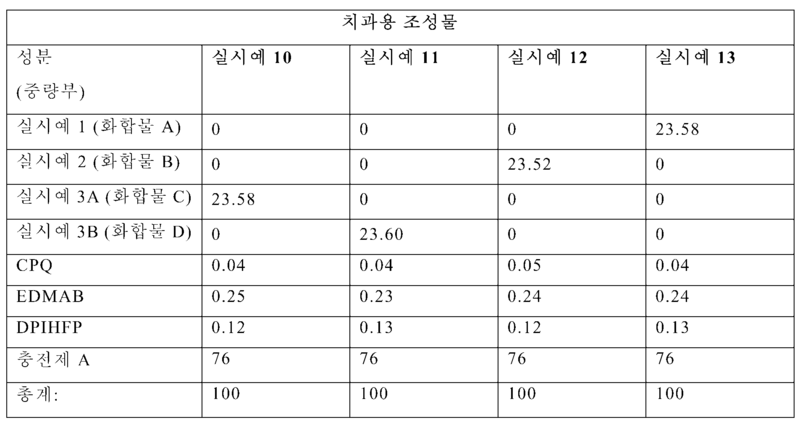 나노충전제는 또한 미국 특허 출원 제10/847,781호 (칸가스(Kangas) 등); Nano-fillers are also U.S. Patent Application No. 10 / No. 847 781 (Khan gas (Kangas), and the like); 미국 특허 출원 제10/847,782호 (콜브(Kolb) 등); U.S. Patent Application No. 10/847 782 No. (Kolb (Kolb), and the like); 미국 특허 출원 제10/847,803호 (크레이그(Craig) 등); U.S. Patent Application No. 10/847 803 No. (Craig (Craig), and the like); 및 미국 특허 출원 제10/847,805호 (버드(Budd) 등)에 기재되어 있는데, 상기 네 건의 미국 특허 출원 모두는 2004년 5월 17일자로 출원되었다. And US Patent Application No. 10 / 847,805 there is described a call (Bird (Budd), etc. ), all of the four cases of US Patent Application was filed dated 17 May 2004. 이들 미국 특허 출원은, 요약하면, 조성물을 포함하는 하기의 나노충전제를 기재하고 있다: 미국 특허 출원 제10/847,781호 (칸가스 등)는 이전의 이오노머 조성물에 비하여 조성물에 개선된 특성을 제공하는 나노충전제를 함유하는 안정한 이오노머 조성물(예를 들어, 유리 이오노머)을 기재하고 있다. The United States patent application, summary, describes a nano-fillers to containing compositions: U.S. Patent Application No. 10/847 781 No. (Khan gas, etc.) to provide a characteristic improvement in the composition than in the ionomer compositions of the prior stable ionomer compositions containing a nano filler has a (e.g., glass ionomer) above. 일 실시 형태에서, 본 조성물은 폴리산(예를 들어, 복수의 산성 반복기를 갖는 중합체); In one embodiment, the compositions polyacid (e.g., a polymer having a plurality of repeater acid); 산-반응성 충전제; Acid-reactive filler; 적어도 10 At least 10 중량％의 나노충전제 또는 각각의 평균 입자 크기가 200 나노미터 이하인 나노충전제들의 조합; The nano-fillers, or each, mean particle size of 200% by weight of a combination of nano-meters or less nano-fillers; 물; water; 및 선택적으로 중합성 성분(예를 들어, 선택적으로 산 작용기를 포함하는 에틸렌계 불포화 화합물)을 포함하는 경화성 치과용 조성물이다. And alternatively for a curable dental composition comprising a polymerizable component (e.g., an ethylenically unsaturated compound comprising optionally acid functionality). 미국 특허 출원 제10/847,782호 (콜브 등)는 광학적으로 반투명하며 방사선 불투과성인 이오노머 시스템과 같이 조성물에 개선된 특성을 제공하는 나노지르코니아 충전제를 함유하는 안정한 이오노머(예를 들어, 유리 이오노머) 조성물을 기재하고 있다. U.S. Patent Application No. 10/847 782 No. (Kolb, etc.) is optically translucent and radiopaque in a stable ionomer containing nano-zirconia filler to provide a characteristic improvement in the composition, such as ionomer systems (e.g., glass ionomer) compositions and the base material. 폴리산을 일반적으로 함유하는 이오노머 조성물로 나노지르코니아가 혼입되는 것을 돕기 위해 나노지르코니아는 실란으로 표면 개질되며, 그렇지 않은 경우 폴리산이 나노지르코니아와 상호작용하여 응결 또는 응집을 야기하여 바람직하지 못한 시각적 불투명성으로 이어진다. To assist in the polyacid typically is nano-zirconia mixed into ionomer compositions containing the nano-zirconia is surface-modified with a silane, or polyacrylic acid leads to visual opacity undesirable causing condensation or coagulation by interacting with nano-zirconia if it is . 일 태양에서, 조성물은 폴리산; In one embodiment, the composition comprises poly-acids; 산-반응성 충전제; Acid-reactive filler; 지르코니아 입자의 외부 표면 상으로 부착된 복수의 실란-함유 분자를 갖는 나노지르코니아 충전제; Of the plurality attached to the outer surface of the zirconia particles, the silane-containing nano-zirconia filler having a molecule; 물; water; 및 선택적으로 중합성 성분(예를 들어, 선택적으로 산 작용기를 포함하는 에틸렌계 불포화 화합물)을 포함하는 경화성 치과용 조성물이다. And alternatively for a curable dental composition comprising a polymerizable component (e.g., an ethylenically unsaturated compound comprising optionally acid functionality). 미국 특허 출원 제10/847,803호 (크레이그 등)는 조성물에 향상된 광학적 반투명성을 제공하는 나노충전제를 함유하는 안정한 이오노머 조성물(예를 들어, 유리 이오노머)을 기재하고 있다. And U.S. Patent Application No. 10/847 803 No. (Craig, etc.) is described a stable ionomer compositions containing nano-fillers to provide enhanced optical translucency in the compositions (e.g., glass ionomer). 일 실시 형태에서, 조성물은 폴리산(예를 들어, 복수의 산성 반복기를 갖는 중합체); In one embodiment, the composition polyacid (e.g., a polymer having a plurality of repeater acid); 산-반응성 충전제; Acid-reactive filler; 나노충전제; Nano-fillers; 선택적인 중합성 성분(예를 들어, 선택적으로 산 작용기를 포함하는 에틸렌계 불포화 화합물); An optional polymerizable component (e.g., an ethylenically unsaturated compound comprising optionally acid functionality); 및 물을 함유하는 경화성 치과용 조성물이다. And for a dental curable composition containing water. 폴리산, 나노충전제, 물 및 선택적인 중합성 성분의 조합된 혼합물의 굴절률(경화 상태 또는 비경화 상태에서 측정)은 일반적으로 산-반응성 충전제 굴절률의 4％ 이내, 전형적으로는 3％ 이내, 더 전형적으로는 1％ 이내, 더욱 더 전형적으로는 0.5％ 이내이다. Polyacids, nano-fillers, the refractive index of the combined mixture of water and optional polymerizable component (measured in the hardened state or the unhardened state) is usually acid-less than 4% of a reactive filler refractive index, typically less than 3%, more typically is, even more than 1% and typically less than 0.5%. 미국 특허 출원 제10/847,805호 (버드 등)는 산-반응성 나노충전제(즉, 나노구조형 충전제) 및 경화성 수지(예를 들어, 중합성 에틸렌계 불포화 화합물)를 함유할 수 있는 치과용 조성물을 기재하고 있다. U.S. Patent Application No. 10/847 805 No. (willow, etc.) acid-reactive nano filler (that is, the nano-structured filler) and a hardenable resin (e.g., a polymerizable ethylenically unsaturated compound) describes a dental composition which may contain and. 산-반응성 나노충전제는 산-반응성, 비-융합 옥시플루오라이드 물질을 포함할 수 있으며, 3가 금속(예를 들어, 알루미나), 산소, 불소 및 알칼리토금속, 및 선택적으로 규소 및/또는 중금속을 포함한다. Acid-reactive nano-filler is acid-reactive, non-can comprise a fused oxyfluoride material, a trivalent metal (e.g., alumina), oxygen, fluorine, and an alkaline earth metal, and optionally silicon and / or heavy metals as It includes. 충전제를 함유하는 본 발명의 일부 실시 형태(예를 들어, 치과용 접착제 조성물)에 있어서, 조성물은 조성물의 총 중량을 기준으로 바람직하게는 적어도 1 중량％, 더 바람직하게는 적어도 2 중량％, 및 가장 바람직하게는 적어도 5 중량％의 충전제를 함유한다. Some embodiments of the present invention containing the filler according to (e. G., Dental adhesive compositions), the compositions are preferably at least 1% by weight based on the total weight of the composition, more preferably at least 2% by weight, and most preferably contains a filler of at least 5% by weight. 그러한 실시 형태에 있어서, 본 발명의 조성물은 조성물의 총 중량을 기준으로 바람직하게는 최대 40 중량％, 더 바람직하게는 최대 20 중량％, 및 가장 바람직하게는 최대 15 중량％의 충전제를 함유한다. In such an embodiment, the compositions of the invention preferably contain up to 40 wt%, more preferably up to 20% by weight, and most preferably the filler of up to 15% by weight, based on the total weight of the composition. 다른 실시 형태에 있어서 (예를 들어, 조성물이 치과용 수복재 또는 치열 교정용 접착제인 경우), 본 발명의 조성물은 조성물의 총 중량을 기준으로 적어도 40 중량％, 더 바람직하게는 적어도 45 중량％, 및 가장 바람직하게는 적어도 50 중량％의 충전제를 함유한다. In another embodiment (e.g., if the composition is a dental restorative material or orthodontic adhesives for use), the compositions of the invention at least 40% by weight based on the total weight of the composition, more preferably at least 45% by weight, and most preferably contains a filler of at least 50% by weight. 그러한 실시 형태에 있어서, 본 발명의 조성물은 조성물의 총 중량을 기준으로 바람직하게는 최대 90중량％, 더 바람직하게는 최대 80 중량％, 더욱 더 바람직하게는 최대 70 중량％, 및 가장 바람직하게는 최대 50 중량％의 충전제를 함유한다 . In such an embodiment, the compositions of the present invention is preferably at most 90% by weight based on the total weight of the composition, more preferably at most 70% by weight, and most preferably up to 80% by weight, even more preferably It contains a filler of up to 50% by weight. 선택적으로, 본 발명의 조성물은, 용매(예를 들어, 알코올(예를 들어, 프로판올, 에탄올), 케톤(예를 들어, 아세톤, 메틸 에틸 케톤), 에스테르(예를 들어, 에틸 아세테이트), 다른 비수성 용매(예를 들어, 다이메틸포름아미드, 다이메틸아세트아미드, 다이메틸설폭사이드, 1-메틸-2-피롤리딘온)), 및 물을 함유할 수도 있다. Alternatively, the compositions of the present invention, a solvent (e.g., alcohols (e.g., propanol, ethanol), ketones (e.g., acetone, methyl ethyl ketone), esters (e.g., ethyl acetate), other non-aqueous solvent (e.g., dimethyl formamide, dimethyl acetamide, dimethyl sulfoxide, 1-methyl-2-pyrrolidinone), and may contain a), and water. 원할 경우, 본 발명의 조성물은 첨가제, 예를 들어 지시약, 염료, 안료, 억제제, 촉진제, 점도 조절제, 습윤제, 완충제, 안정제, 및 당업자에게 자명한 다른 유사한 성분들을 함유할 수 있다. If desired, the compositions of the present invention may contain additives, such as an indicator, dyes, pigments, inhibitors, accelerators, viscosity modifiers, wetting agents, buffers, stabilizers, and other similar components apparent to those skilled in the art. 점도 조절제는 열반응성 점도 조절제(예를 들어, 미국 뉴저지주 파시파니 소재의 바스프 위안도트 코포레이션(BASF Wyandotte Corporation)으로부터 입수가능한 플루로닉(PLURONIC) F-127 및 F-108)를 포함하며, 이 조절제 상의 중합성 부분 또는 이 조절제와 상이한 중합성 성분을 선택적으로 포함할 수 있다. And a viscosity controlling agent comprises a (Nick (PLURONIC) F-127 and F-108 to the flu, available from, for example, BASF yuan dot Corporation (BASF Wyandotte Corporation of New Jersey, USA Parsippany material)), heat-reactive viscosity modifier, and the polymeric part or a control agent and the different polymeric components on the adjusting agent may optionally be included. 그러한 열반응성 점도 조절제가 미국 특허 제6,669,927호 (트롬(Trom) 등) 및 미국 특허 공개 제2004/0151691호 (옥스만(Oxman) 등)에 기재되어 있다. Such a heat-reactive viscosity control agent are described in U.S. Patent No. 6,669,927 (thrombopoietin (Trom), etc. ), and U.S. Patent Publication No. 2004/0151691 call (only Oaks (Oxman), etc.). 추가적으로, 의약품 또는 다른 치료용 물질이 치과용 조성물에 선택적으로 첨가될 수 있다. Additionally, a material for pharmaceuticals or other treatment can be optionally added to the dental composition. 예에는, 치과용 조성물에 종종 사용되는 유형의 플루오라이드 공급원, 미백제, 항우식제(예를 들어, 자일리톨), 칼슘 공급원, 인 공급원, 재광화제(remineralizing agent)(예를 들어, 인산칼슘 화합물), 효소, 구강청정제, 마취제, 응혈제, 산 중화제, 화학요법제, 면역 반응 조절제, 틱소트로프(thixotrope), 폴리올, 항염증제, 항미생물제(항미생물성 지질 성분 이외), 항진균제, 구강건조증 치료제, 감감작제(desensitizer) 등이 포함되지만, 이로 한정되는 것은 아니다. Examples include, often fluoro used type of fluoride sources, whitening agents, Xiang Yu sikje (e.g., xylitol), calcium sources, phosphorus sources, jaegwang agent (remineralizing agent) (e.g., calcium phosphate compounds) in the dental composition, enzymes, mouth fresheners, anesthetics, procoagulant agents, acid neutralizers, chemotherapeutic agents, immune response modifiers, thixotropic (thixotrope), polyols, anti-inflammatory agents, antimicrobial agents (anti-microbial non-lipid component), antifungal agents, dry mouth treatment, Detect construct (desensitizer) and the like, but is not limited thereto. 또한, 임의의 상기 첨가제들의 조합도 이용될 수 있다. Further, it may also be used in combination of any of the above additives. 그러한 첨가제 중 임의의 하나의 선택 및 그 양은 과도한 실험 없이 원하는 결과가 달성되도록 당업자에 의해 선택될 수 있다. The choice of any one of such additives and their amounts such that the desired result is achieved without undue experimentation may be selected by one skilled in the art. 본 발명의 경화성 치과용 조성물은, 통상적인 혼합 기술을 사용하여 하이브리드 단량체를 다른 선택 성분, 예를 들어 하나 이상의 추가의 단량체, 예를 들어 에틸렌계 불포화 성분(예를 들어, 치환 (메트)아크릴 화합물)과 조합함으로써 제조할 수 있다. The curable dental composition of the present invention, conventional mixing techniques, with the optional other hybrid monomer component, for the addition of monomer at least one instance, for example, an ethylenically unsaturated component (e.g., a substituted (meth) acrylate compound ) and it may be prepared by combining. 생성된 조성물은 본 명세서에 설명된 것과 같은 증강제, 계면활성제, 충전제, 물, 공용매 및 다른 첨가제를 선택적으로 함유할 수도 있다. The resulting composition may optionally contain an enhancer, a surfactant, a filler, water, co-solvents and other additives as described herein. 사용시, 조성물은 광개시제 시스템을 함유하여 광개시에 의해서 경화될 수 있거나, 또는 화학 중합에 의해서 경화되고 산화환원 경화 시스템을 함유할 수 있으며, 이 경우 조성물은 산화제 및 환원제를 함유한다. In use, the composition may contain a reduced cure systems hardening is oxidized by, or chemically cured or can be cured by initiation with light containing a photo-initiator system, in which case the composition contains an oxidizing agent and a reducing agent. 대안적으로는, 조성물이 광중합성 및 화학적 중합성 조성물 둘 모두가 될 수 있도록 경화성 조성물은 상이한 개시제 시스템들을 함유할 수도 있다. Alternatively, the curable composition may contain different initiator systems so that the composition can be both a photopolymerizable and a chemically polymerizable composition. 본 발명의 경화성 조성물은 1-부분 시스템 및 다중-부분 시스템, 예를 들어 2-부분 분말/액체, 페이스트/액체, 및 페이스트/페이스트 시스템을 포함하는 다양한 형태로 공급될 수 있다. The curable compositions of the present invention are one-part systems and multi-can be supplied in various forms, including parts of the system, for example, two-part powder / liquid, paste / liquid, and paste / paste systems. 각각이 분말, 액체, 젤 또는 페이스트의 형태인 다중-부분 조합(즉, 둘 이상의 부분의 조합)이 이용되는 다른 형태들이 또한 가능하다. Each of the powder, liquid, gel or paste in the form of a multi-type that is different (i.e., a combination of two or more parts) parts in combination are used are also possible. 산화환원 다중-부분 시스템에서, 한 부분은 전형적으로 산화제를 함유하고, 다른 부분은 전형적으로 환원제를 함유한다. Redox multiple-part system, one part typically contains the oxidizing agent and another part typically contains the reducing agent. 항미생물성 지질 성분을 함유하는 다중-부분 시스템에서, 한 부분은 전형적으로 항미생물성 지질 성분을 함유하고 다른 부분은 경화성 성분 또는 최종 조성물의 다른 성분을 함유한다. Multi-containing antimicrobial lipid component from part system, one part typically contains the antimicrobial lipid component and the other portion contains the other components of the curable composition or the final composition. 경화성 조성물의 성분들은 키트 내에 포함될 수 있으며, 키트에서 조성물의 내용물들은 성분들이 필요해질 때까지 성분들의 보관이 허용되도록 패키지된다. Components of the curable compositions may be included in the kit, the contents of the composition in the kit are packaged to permit storage of the components until the components are needed. 치과용 조성물로서 사용될 때, 경화성 조성물의 성분들은 통상적인 기술을 사용하여 혼합되어 임상적으로 적용될 수 있다. When used as a dental composition, the curable composition components can be mixed using conventional techniques can be applied clinically. 광중합성 조성물의 개시에는 일반적으로 경화 광이 필요하다. Disclosure of the photopolymerizable composition is generally cured by light is required. 조성물은 상아질 및/또는 법랑질에 매우 잘 부착하는 복합재 또는 수복재의 형태일 수 있다. Composition may be in the form of a composite or restorative material that is very well adhered to the dentin and / or enamel. 선택적으로, 프라이머 층(primer layer)이 경화성 조성물이 사용되는 치아 조직에 사용될 수 있다. Alternatively, the primer layer (primer layer) may be used in the dental tissue is the curable composition used. 예를 들어, FAS 유리 또는 다른 플루오라이드 방출 물질을 함유하는 조성물이 또한 매우 우수한 장기간의 플루오라이드 방출을 제공할 수 있다. For example, a composition containing a FAS glass or other fluoride-emitting substance can also provide very good long-term fluoride release. 본 발명의 몇몇 실시 형태는 광 또는 다른 외부 경화 에너지의 적용없이 벌크로 경화될 수 있고 사전 처리가 필요없으며 향상된 물리적 특성을 갖는 유리 이오노머 시멘트 또는 접착제를 제공할 수도 있다. Some embodiments of the present invention can not be cured in bulk without the application of light or other external curing energy, and requires a pre-treatment may provide glass ionomer cements or adhesives with improved physical properties. 본 발명의 조성물은 특히 충전되거나 충전되지 않을 수 있는 매우 다양한 치과 재료의 형태로 사용하기에 특히 적합하다. The compositions of the invention are particularly suitable for use in the form of a wide variety of dental materials, which may not be particularly charged or charged. 본 조성물은 실란트, 코팅 또는 치과용 접착제에 사용될 수 있으며, 이는 치아에 인접하여 분배된 후(즉, 치과 재료가 치아에 일시적 또는 영구적 결합으로 또는 가볍게 누르는 접촉으로 놓여진 후) 경화되는, 약간 충전된 복합재(조성물의 총 중량을 기준으로 최대 40 중량％의 충전제) 또는 미충전 조성물이다. The composition of the sealant, may be used for coating or a dental adhesive for, which after the adjacent teeth distribution that (that is, the dental material is then placed in contact pressing temporarily or permanently bonded or lightly on the teeth) cured, partially charged a composite material (up to 40% by weight of filler based on the total weight of the composition) or unfilled compositions. 본 조성물은 전형적으로 충전된 조성물(바람직하게는 40 중량％ 초과, 최대 90 중량％의 충전제 함유)인 치과용 및 치열 교정용 시멘트, 치열 교정용 접착제, 복합재, 충전 재료, 인상 재료 및 수복재에 사용될 수 있다. The compositions are typically filled compositions (preferably 40 weight%, containing up to 90% by weight of filler) of dental and orthodontic cements, used in orthodontics for adhesives, composites, filling materials, impression materials and restorative material for can. 조성물은 또한 치아에 인접하여 배치되기 전에 최종 용도(예를 들어, 치관, 브리지, 베니어, 인레이, 온레이 등으로서)를 위해 성형 및 중합되는 보철물에 사용될 수 있다. The composition may also be used in prostheses that are molded and polymerized for final use (e.g., as crown, bridge, veneer, inlay, onlay, and so on) before being disposed adjacent to a tooth. 그러한 사전 성형된 물품들은 치과 의사 또는 다른 사용자에 의해서 주문-맞춤(custom-fitted) 형태로 성형되거나 연마될 수 있다. Such a pre-molded goods are ordered by the dentist or other user may be customized (custom-fitted) it molded in the form or polishing. 경화 치과 재료는 경화성 성분들로부터 제조되는 임의의 매우 다양한 재료일 수 있으며, 바람직하게는 경화 치과 재료는 표면 사전 처리 재료(예를 들어, 에칭제(etchant) 또는 프라이머)가 아니다. Curing dental materials can be any of a wide variety of materials that are prepared from hardenable components, preferably hardened dental material is not a surface pre-treatment material (e.g., etchant (etchant) or primer). 오히려, 바람직하게는 경화 치과 재료는 수복재(예를 들어, 충전물 또는 보철물), 밀 블랭크 또는 치열 교정 장치이다. Rather, preferably, the curing dental restorative material is a material (e.g., filling or prosthesis), mill blank, or orthodontic device. 본 조성물은 종래의 광-경화성 시멘트의 경화가 달성되기 어려울 수도 있는 임상 용도에서 유용하다. The composition of the prior art light is advantageous in clinical use, which may be difficult to achieve the curing of the curable cement. 그러한 용도는, 심부 수복, 큰 치관 제작(build-up), 치내요법에 의한 수복, 치열 교정용 브래킷(bracket)(예를 들어, 페이스트 부분이 브래킷에 미리 도포되고 액체 부분이 나중에 치아 상에 솔질될 수 있는 사전-코팅된 브래킷을 포함), 밴드, 협측 튜브(buccal tube) 및 기타 장치의 부착, 금속 치관 또는 다른 광-불투과성 보철 장치의 치아로의 루팅, 및 구강의 접근하기 어려운 부위에서의 다른 수복재 적용을 포함하지만, 이로 한정되는 것은 아니다. Such uses include, deep restorations, for large crown production (build-up), restoration, dental orthodontic bracket (bracket) according to materializing therapy (for example, a paste portion is pre-applied to the bracket brushed onto the liquid part of the teeth later dictionary that can be-coated bracket included), bands, buccal tubes (buccal tube) and the other attachment of the device, the metal crowns or other light-fire route to the teeth of the transparent prosthetic device, and in the hard-to-reach areas of the oral cavity It includes other restorative application, but is not limited thereto. 전형적인 조성물은 치과용 접착제, 치열 교정용 접착제, 복합재, 수복재, 치과용 시멘트, 치열 교정용 시멘트, 실란트, 코팅, 인상 재료, 충전 재료, 또는 이들의 조합으로서 사용된다. Typical compositions are used as dental adhesives, orthodontic adhesives for, composite, restorative, dental cement, cement for orthodontics, sealants, coatings, impression materials, filling materials, or combinations thereof. 본 발명의 추가의 특징들 및 이점들이 하기 실시예에 의해 추가로 예시되는데, 실시예는 그를 한정하고자 하는 것이 결코 아니다. There is further illustrated to have additional features and advantages of by embodiments of the present invention, examples are by no means intended to limit him. 본 발명은 본 명세서에 설명된 특정 실시예에 한정되는 것으로 간주되어서는 아니되며, 오히려 첨부된 청구의 범위에 적절히 기재된 본 발명의 모든 태양을 포함하는 것으로 이해되어야 한다. The present invention is intended to include all aspects of the present are not to be construed as limited to the particular embodiments described herein, but rather well defined in the appended claims invention. 본 명세서의 개관시 본 발명에 적용될 수 있는 다양한 변형, 등가의 공정뿐만 아니라, 다수의 구조는 본 발명과 관계된 당해 기술 분야의 숙련자에게 쉽게 자명해질 것이다. Upon opening of this specification as well as many modifications, equivalent processes which can be applied to the present invention, a number of structures will be readily apparent to those skilled in the art related to the present invention. 달리 표시되지 않는 한, 실시예에 제공된 모든 부 및 백분율은 중량 기준이며, 모든 물은 탈이온수이고, 모든 분자량은 중량 평균 분자량이다. All parts and percentages given in the Examples unless otherwise indicated are by weight, and all water is deionized water, and all molecular weights are weight average molecular weight. 시험 샘플의 압축 강도를 하기 절차에 따라 측정하였다. It was measured according to the compressive strength of the test sample procedure. 비경화 복합재 샘플을 4-㎜(내경) 유리 튜브 내로 주입하고, 이 튜브를 실리콘 고무 마개로 막고, 이어서 튜브를 대략 0.28 MPa(2.88 ㎏/㎠)의 압력에서 5분 동안 축방향으로 압축하였다. The uncured composite sample introduced into the 4-㎜ (inside diameter) glass tube, and this prevents the tube with a silicone rubber stopper, followed by compressing the tube in the axial direction for 5 minutes at a pressure of approximately 0.28 MPa (2.88 ㎏ / ㎠). 이어서 샘플을 XL 1500 치과용 경화등(curing light)(쓰리엠 컴퍼니, 미국 미네소타주 세인트 폴 소재)에 노출시킴으로써 80초 동안 광 경화시키고, 이어서 쿨처(Kulzer) UniXS 경화 박스 (헤라에우스 쿨처 게엠베하(Heraeus Kulzer GmbH), 독일 소재)에서 90초 동안 조사하였다. Then mouse samples in XL 1500 dental curing for such (curing light) by exposure to (3M Company, Minnesota, USA, St. Paul,) and light cured for 80 seconds, then kulcheo (Kulzer) UniXS curing box (spatula kulcheo geem beha ( from Heraeus Kulzer GmbH), the German material) were examined for 90 seconds. 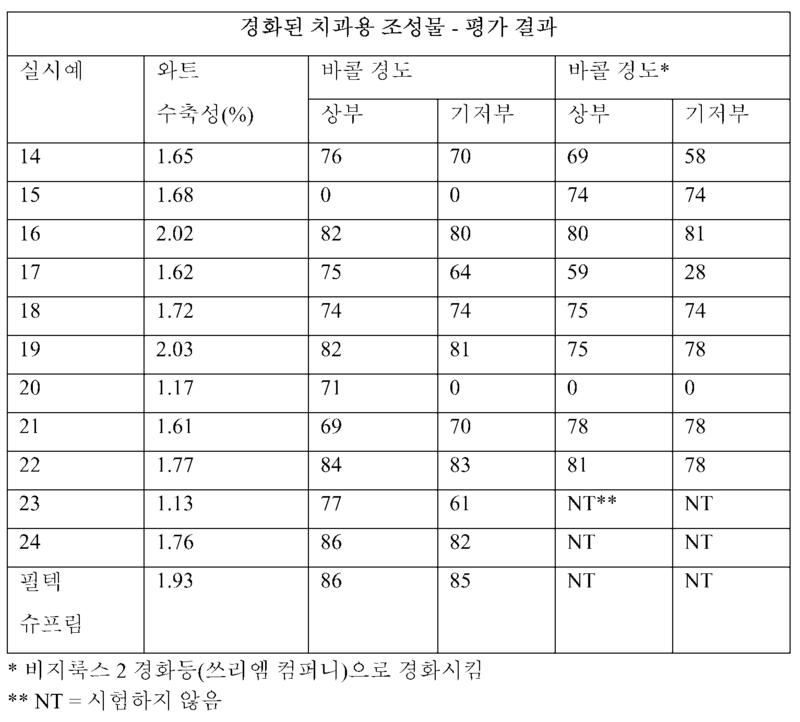 경화된 샘플은 약 37℃/90％+ 상대 습도에서 1시간 동안 정치하고, 이어서 다이아몬드 톱으로 절단하여 압축 강도의 측정을 위한 8-㎜ 길이의 실린더형 플러그(plug)를 형성하였다. The cured sample was allowed to stand for about 37 ℃ / 90% + 1 hour at a relative humidity, followed by forming a cylindrical plug (plug) of the 8-㎜ length were cut with a diamond saw for measurement of compressive strength. 플러그를 시험하기 전에 약 24시간 동안 37℃에서 증류수 중에 보관하였다. Prior to testing the plugs were stored in distilled water at 37 ℃ for about 24 hours. 측정은, 문헌[ISO Specification 7489] (또는 문헌[American Dental Association (ADA) Specification No. 27])에 따라 10 킬로뉴턴(kN) 로드셀(load cell)을 갖는 인스트 론(Instron) 시험기(인스트론 4505, 인스트론 코포레이션 (Instron Corp.), 미국 매사추세츠주 캔톤 소재)에서 1 ㎜/분의 크로스헤드 속도로 수행하였다. Measurements, literature [ISO Specification 7489] (or the literature [American Dental Association (ADA) Specification No. 27]) In-tron (Instron) tester with a 10 kilo Newtons (kN) load cell (load cell) according to (Instron 4505, Instron Corporation was carried out by 1 ㎜ / min crosshead speed in (Instron Corp.), Canton, Massachusetts, USA material). 경화된 샘플의 5개의 실린더를 제조하고 측정하여, 결과를 5개 측정치의 평균으로서 MPa 단위로 기록하였다. To prepare a five cylinders of cured samples was measured, and recorded the results in MPa as the average of five units of measurement. 시험 샘플의 간접 인장 강도는 CS 측정 시험 방법에 대해 설명된 바와 같이 측정하되, 경화된 샘플을 DTS의 측정을 위해 2.2-㎜ 두께 디스크로 절단하였다. Tensile strength of the test sample was cut, but cured samples measured as described for the CS Test Method measured in 2.2-㎜ thick disks for measurement of DTS. 디스크를 물 중에 보관하고, 상기 설명한 바와 같이 인스트론 시험기로 측정하였다. Store discs into water, which was measured with an Instron testing machine as described above. 경화된 샘플의 6개의 디스크를 제조하고 측정하여, 결과를 6개 측정치의 평균으로서 MPa 단위로 기록하였다. To prepare a six disks of cured samples was measured, and recorded the results in MPa as the average of six measurements of the unit. 왓츠 수축성 측정 시험 방법에서는 경화 후의 부피 변화의 관점에서 시험 샘플의 수축성을 측정한다. Watts and contractility measured in the test method measures the shrink properties of the test sample in terms of volumetric change after curing. 샘플 제조 (90-mg의 경화되지 않은 복합재 시험 샘플) 및 시험 절차는 하기 참고 문헌에 기재된 바와 같이 수행하였다: 문헌[Determination of Polymerization Shrinkage Kinetics in Visible-Light-Cured Materials:Methods Development, Dental Materials, October 1991, pages 281-286]. Sample preparation (the composite test samples that are not cured of the 90-mg), and the test procedures for reference was carried out as described in literature, the literature [Determination of Polymerization Shrinkage Kinetics in Visible-Light-Cured Materials: Methods Development, Dental Materials, October 1991, pages 281-286]. 결과를 수축％로 각각의 샘플에 대하여 3회 반복한 평균으로서 기록하고, 쓰리엠 필텍 슈프림 유니버셜 리스토러티브(3M FILTEK SUPREME Universal Restorative) (쓰리엠 컴퍼니)의 성능에 대하여 표준화하였다. Record the results as the average% shrinkage in repeated three times for each sample, and 3M piltek Supreme Universal Restorative was normalized with respect to the performance of the (3M FILTEK SUPREME Universal Restorative) (3M Company). 디스크형 (1-㎜ 두께 x 15-㎜ 직경)의 페이스트 샘플을 6 ㎜ 거리에서 디스크 각각의 면에 비지룩스(VISILUX) 2 경화등(쓰리엠 컴퍼니)으로부터의 조사광에 60초 동안 노출시켜 경화시켰다. Was cured by exposure for 60 seconds to the irradiation light from the busy lux (VISILUX) 2 curing light (3M Company), the paste samples of the disk-shaped (1-㎜ thickness x 15-㎜ diameter) in the side of the disc, respectively in 6 ㎜ distance . 경화된 샘플을 맥베스 (맥베스, 미국 뉴욕주 뉴버그 소재)로부터 입수가능한 가시광 필터가 구비된 맥베스 투과 농도계 모델 TD-903을 사용하여 디스크의 두께를 통한 광의 투과도를 측정함으로써 직접적인 광 투과도에 대해 측정하였다. The cured samples Macbeth were measured for direct light transmission (Macbeth, New York, USA Newburgh material) by using a commercially available visible light filter is a Macbeth transmission densitometer Model TD-903 equipped from the measurement of the light transmittance through the thickness of the disc . 보다 낮은 맥베스 값은 물질의 보다 낮은 시각적 불투명도 및 보다 큰 반투명성을 나타낸다. Macbeth lower values ​​indicate a lower visual opacity and greater translucency than the material. 기록된 값은 3개 측정치의 평균이다. The recorded value is the average of three measurements. 시험 샘플의 바콜 경도를 하기 절차에 따라 측정하였다. It was determined according to the Barcol Hardness of a test sample procedure. 경화되지 않은 복합재 샘플을 폴리에스테르(PET) 필름 시트와 유리 슬라이드 사이에 개재된 2.5-㎜ 두께의 테플론(TEFLON) 주형(mold)에서 엘리파르 프리라이트(ELIPAR Freelight) 2 치과용 경화등(쓰리엠 컴퍼니)을 사용하여 30초 동안 경화하였다. Poly the composite sample uncured polyester (PET) film sheets and glass Eli Parr free light (ELIPAR Freelight) in a 2.5-㎜ TEFLON (TEFLON) a template (mold) with a thickness interposed between the slide 2 dental curing for light (3M Company ), which was cured for 30 seconds using. 조사 후에, PET 필름을 제거하고, 압입자(indenter)가 구비된 바버-콜맨 임프레서(Barber-Coleman Impressor) (핸드헬드(hand-held) 휴대용 경도 시험기; 모델 GYZJ 934-1; 바버-콜맨 컴퍼니, 인더스트리얼 인스트루먼츠 디비젼(Barber-Coleman Company, Industrial Instruments Division), 미국 인디애나주 로바스 파크 소재)를 사용하여 주형의 상부 및 기저부 둘 모두에서 샘플의 경도를 측정하였다. After the irradiation, removing the PET film, and the indenter (indenter) is provided with a Barber-Coleman Imp suppressor (Barber-Coleman Impressor) (Handheld (hand-held) portable hardness tester; Model GYZJ 934-1; Barber-Coleman Company , Industrial Instruments Division (Barber-Coleman Company, Industrial Instruments Division), using the Indiana State Park Roba's material) to measure the hardness of samples from both the top and bottom of the mold. 상부 및 기저부에서의 바콜 경도 값을 광 노출 5분 후에 측정하였다. The Barcol hardness values ​​at the top and bottom was measured 5 minutes after light exposure. 각각의 샘플에 대하여 3회 반복한 것의 평균치로서 결과를 기록하고, 쓰리엠 필텍 슈프림 유니버셜 리스토러티브 (쓰리엠 컴퍼니)의 성능에 대하여 표준화하였다. Record the result as the average value of what was repeated three times for each sample, which was standardized with respect to the performance of 3M piltek Supreme Universal Restorative (3M Company). 7-메틸렌-1,5-다이티아사이클로옥탄-3-올 (C-8 알코올; 2.9 g, 16 mmole) 및 다이부틸 주석 다이라우레이트(10 ㎎; 시크마-알드리치)를 질소 하에 건조 테트라하이드로푸란 (THF, 10 ㎖) 중에 용해하였다. 7-methylene-1,5-dimethyl-thiazol bicyclo octane-3-ol (C-8 Alcohol; 2.9 g, 16 mmole), and dibutyltin dilaurate (10 ㎎; seek Do-Aldrich) in dry tetrahydro under nitrogen It was dissolved in tetrahydrofuran (THF, 10 ㎖). 생성된 용액을 가열 환류시키고, 건조 THF (10 ㎖) 중의 2,4,4-트라이메틸-1,6-다이아이소시아나토헥산 (1.76 g, 8.2 mmole)의 용액을 적가하였다. The resulting solution was heated to reflux, it was added dropwise a solution of 2,4,4-trimethyl-1,6-dayiahyi SOCCIA NATO hexane (1.76 g, 8.2 mmole) in dry THF (10 ㎖). 출발 C8-알코올이 소비될 때까지 박막 크로마토그래피(에테르:메틸렌 클로라이드 1:1)로 반응을 모니터링하였다. (약 12 시간의 반응 시간) 이어서, 용매를 증발시켜서 점성의 투명한 오일/고무를 얻었다. From C8- thin layer chromatography until the alcohol is consumed (ether: methylene chloride 1: 1). The reaction was monitored by (about 12 hours reaction time) followed by evaporation of the solvent to obtain a clear oil / viscosity of the rubber. 이 오일/고무를 메탄올(그램 당 15 ㎖)에 용해시킴으로써 정제하여, 다소 유백색인 용액을 얻었다. Yi oil / gum was purified by dissolving in methanol (15 ㎖ per gram), to obtain a slightly milky white in solution. 소량의 고무를 분리하였다. A small amount of rubber was isolated. 용액을 다른 플라스크 내로 여과시키고, 물 (그램 당 3 ㎖)을 교반하면서 서서히 여과액에 첨가하였다. The solution was filtered into another flask, and while stirring the water (3 ㎖ per gram) was added slowly to the filtrate. 첨가하는 동안, 용액으로부터 백색 잔류물이 분리되었다. During the addition, the white residue was separated from the solution. 액체 용매를 가만히 따라내고, 잔류물을 3.5:1의 메탄올:물로 세척하였다. Still out along the liquid solvent, the residue was 3.5: and washed with water: methanol: 1. 세척된 잔류물을 메틸렌 클로라이드 중에 용해하고, BHT 억제제 (그램 당 1 ㎎)를 첨가하고, 용액을 황산나트륨으로 건조시켰다. The washed residue is dissolved, adding the inhibitor BHT (1 ㎎ per gram) in methylene chloride, dry the solution over sodium sulfate. 용매를 증발시켜서 다소 탁한 점성 액체(4.36 g, 수율: 96％)를 얻었다. Evaporation of the solvent slightly cloudy viscous liquid (4.36 g, yield: 96%) was obtained. C-8 다이우레탄의 생성물 구조를 1H 및 13C NMR로 확인하였다. 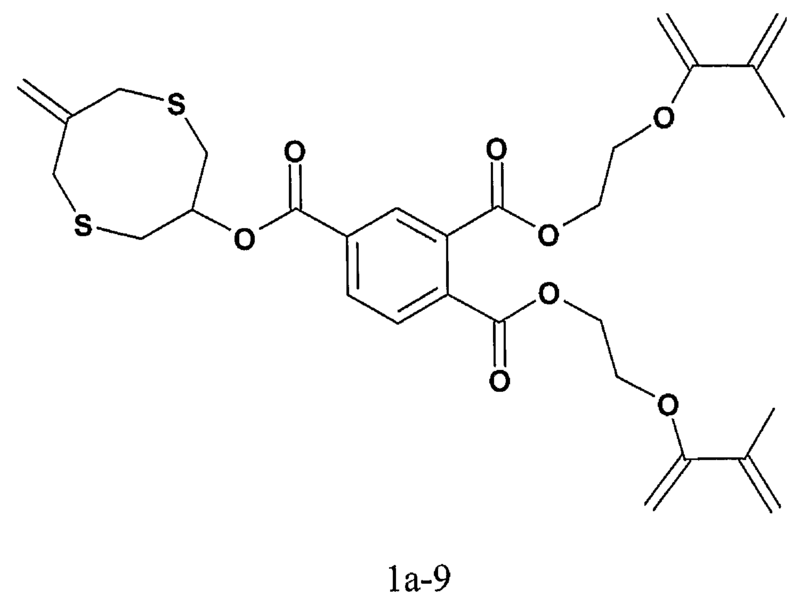 The product structure of C-8 die urethane was confirmed by 1H and 13C NMR. 모노-2-메타크릴로일옥시에틸 프탈레이트 (9.4 g, 31 mmole, 시그마-알드리치) 및 C-8 알코올 (5.38 g, 31 mmole)은 자성 교반 막대 및 질소 기체 유입구가 구비된 3-목 플라스크 안의 메틸렌 클로라이드 (50 ㎖)에 용해시켰다. And in the C-8 alcohol (5.38 g, 31 mmole) is a flask equipped with a magnetic stir bar and a nitrogen gas inlet, 3-neck-mono-2-methacryloyloxyethyl phthalate (Aldrich, 9.4 g, 31 mmole, Sigma) It was dissolved in methylene chloride (50 ㎖). DMAP (400 ㎎)를 첨가하고, 생성된 혼합물을 빙조에서 20분 동안 냉각시켰다. It was added DMAP (400 ㎎) and the resulting mixture was cooled for 20 minutes in an ice bath. 냉각된 용액에 메틸렌 클로라이드 (50 ㎖) 중 DCC (6.95 g, 34 mmol)의 용액을 첨가하였다. A solution of DCC (6.95 g, 34 mmol) in methylene chloride (50 ㎖) To the cooled solution was added. 첨가는, 플라스크 내용물을 0℃에서 질소 하에 계속 교반하면서 1시간에 걸쳐 적가하는 식으로 수행하였다. The addition was performed at 0 ℃ The contents of the flask in such a way that with continued stirring under nitrogen was added dropwise over 1 hour. 이어서 생성된 혼합물을 빙조에서 1시간 동안, 이어서 실온에서 하룻밤 플라스크와 함께 교반하였다. Then while the resulting mixture for 1 hour at ice bath, then stirred overnight with the flask at room temperature. 생성된 침전물은 여과 보조 셀라이트를 갖는 부흐너(Buchner) 깔때기를 사용하여 진공 여과로 제거하였다. The resulting precipitate was removed using a Buchner (Buchner) funnel having a filtration auxiliary celite by vacuum filtration. 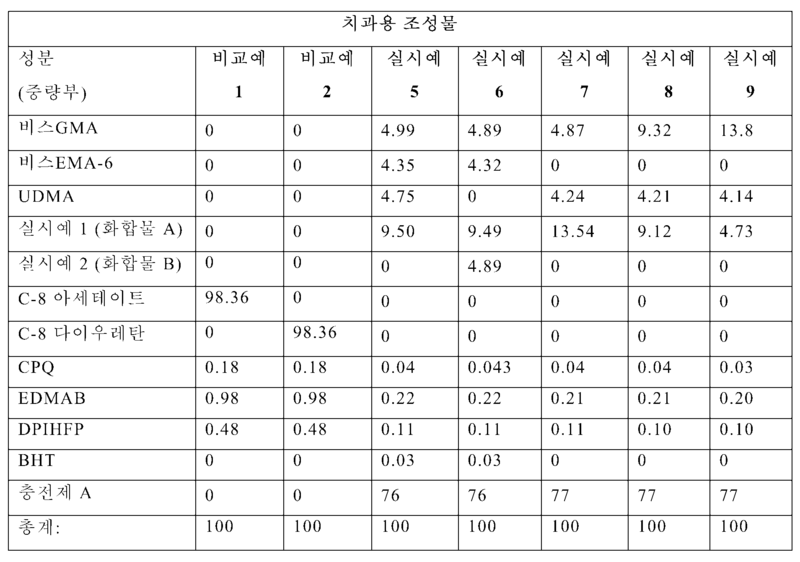 이어서 여과액을 0.1 N HCl (100 ㎖)로 1회, 5％ NaOH (100 ㎖)로 1회, 그리고 물 (100 ㎖)로 1회 세척하였다. Then once the filtrate by 0.1 N HCl (100 ㎖), 1 times with 5% NaOH (100 ㎖), and washed once with water (100 ㎖). 유기층을 건조시키고 농축시켜 약간 탁한 점성 액체 (11.4 g; 수율: 84％)를 얻었다. The organic layer was dried and concentrated slightly cloudy viscous liquid (11.4 g; yield: 84%) was obtained. 실시예 1(화합물 A)의 순도 및 구조를 13C 및 1H NMR로 확인하였다. Purity and structure of Example 1 (compound A) was confirmed by 13C and 1H NMR. 2,4,4-트라이메틸-1,6-다이아이소시아나토헥산 (17.6 g, 84 mmol)을 교반 막대 및 질소 유입구가 구비된 3-목 플라스크 안의 메틸렌 클로라이드 (100 ㎖)에 용해시켰다. 2,4,4-trimethyl-1,6-dayiahyi SOCCIA NATO hexane (17.6 g, 84 mmol) was dissolved in a methylene chloride (100 ㎖) in 3-neck flask equipped with a stir bar and nitrogen inlet. 플라스크에 다이부틸 주석 다이라우레이트(10 드롭(drop), 시그마-알드리치)를 첨가하고, 계속 교반되고 있는 용액에 C-8 알코올을 약간 증가시키면서 추가로 첨가하였다(첨가된 총량: 14.8 g, 84 mmol). The flask dibutyltin dilaurate (10 drop (drop), Sigma-Aldrich) was added and, while slightly increasing the C-8 alcohol in solution with continued stirring was further added (the addition of the total amount: 14.8 g, 84 mmol). 생성된 혼합물을 실온에서 6시간 동안 교반시켰으며, 그동안 박층 크로마토그래피(4:1의 헥산:에틸 아세테이트, 유리 플레이트 상의 실리카 겔)로 모니터링할 때 모든 C-8 알코올이 소멸되었다. Stylized stirred for 6 hours and the resulting mixture at room temperature, during which time thin layer chromatography all the C-8 alcohol to monitor a (4: 1 hexanes-ethyl acetate, silica gel on the glass plate) was destroyed. HEMA (10.92 g, 84 mmole)를 상기 혼합물에 적가하고, 이소시아나토 부분 (-NCO)의 소멸을 FT(Fourier Transform) IR 분광기로 모니터링하였다. It was added dropwise a HEMA (10.92 g, 84 mmole) in the mixture, which was monitoring the disappearance of the isocyanato part (-NCO) by FT (Fourier Transform) IR spectroscopy. 교반을 하룻밤 계속하였으며, 그 후 IR에 의하면 약 95％의 NCO 반응 완료가 나타났다. It was continued stirring overnight, the reaction was completed the NCO of about 95% was, according to IR and then. 메탄올 (10 ㎖)을 첨가하고 0.5시간 후 NCO 반응을 완료시켰다. Add methanol (10 ㎖) and was complete, the NCO reaction after 0.5 h. 용매를 진공 하에 제거하여 실시예 2(화합물 B)의 화합물을 무색 점성 액체로 얻었다. To give a compound of the solvent was removed under vacuum to Example 2 (Compound B) as a colorless viscous liquid. 수율은 정량적이었다. The yield was quantitative. 순도 및 구조를 13C 및 1H NMR로 확인하였다. Purity and structure were confirmed by 13C and 1H NMR. 실시예 1에 대하여 설명한 일반적인 에스테르화 절차에 따라 실시예 3A를 C-8 알코올 및 모노-2-메타크릴로일옥시에틸 석시네이트 (시그마-알드리치)로부터 제조하였다. 3A exemplary embodiments according to the general esterification procedure described for Example 1 C-8 Alcohol and mono-2-methacryloyl oxyethyl succinate (Sigma-Aldrich) as prepared from. 실시예 3A(화합물 C)의 순도 및 구조 입증은 1H 및 13C NMR로 확인하였다. Example 3A Purity and structure verification of (compound C) was confirmed by 1H and 13C NMR. 실시예 1에 대하여 설명한 일반적인 에스테르화 절차에 따라 실시예 3B를 C-8 알코올 및 모노-2-아크릴로일옥시에틸 석시네이트 (시그마-알드리치)로부터 제조하였다. Example 1 to Example 3B according to the general esterification procedure described with respect to the C-8 oxyethyl succinate (Sigma-Aldrich) with an alcohol and mono-2-acrylate was prepared from. 실시예 3B (화합물 D)의 순도 및 구조 입증은 1H 및 13C NMR로 확인하였다. Example 3B demonstrate the purity and structure (Compound D) was confirmed by 1H and 13C NMR. 2,2-비스(하이드록시메틸)프로피온산 (15.0 g, 112 mmol, 시그마-알드리치)을 질소 하에 자성 교반 막대를 사용하여 계속 교반하면서 THF (100 ㎖)에 현탁시켰다. 2,2-bis (hydroxymethyl) propionic acid (15.0 g, 112 mmol, Sigma-Aldrich) and stirring continued using a magnetic stir bar under nitrogen was suspended in THF (100 ㎖). 실온에서 격렬하게 교반되는 현탁물에 다이부틸주석 다이라우레이트 (10 드롭)를 첨가하고, 이어서 IEM (35.4 g, 112 mmol)을 적가하였다. The suspension is stirred vigorously at room temperature was added dibutyltin dilaurate (10 drops), followed by dropwise addition of IEM (35.4 g, 112 mmol). 혼합물을 하룻밤 교반시켰으며 (혼합물은 투명해짐), FTIR에 의하면 5％ 미만의 -NCO 부분이 반응하지 않은 채 남아있는 것으로 나타났다. The mixture was let stir overnight (the mixture becomes transparent), it shows that, according to FTIR remains the -NCO portion of less than 5% unreacted. 메탄올 (2 ㎖)을 첨가하고, 이 혼합물을 가외로 2시간 동안 교반시켰는데, 그 후 모든 -NCO가 반응하였다. Add methanol (2 ㎖), and I ordered stirred for 2 hours, the mixture was extra, and then the reaction was all -NCO. 용매를 회전식 증발기에서 제거하여 투명한 점성 액체 (IEM 부가물-프로피온산)를 정량적인 수율로 얻었다. The solvent was removed on a rotary evaporator to a clear viscous liquid (IEM adduct-propionic acid) was obtained in a quantitative yield. 단리된 IEM 부가물-프로피온산은 실시예 1에 대하여 설명한 일반적인 에스테르화 절차에 따라 C-8 알코올로 에스테르화하였다. Adding the isolated IEM water-propionic acid was esterified to C-8 alcohol according to the general esterification procedure described for Example 1. 백색 왁스 고형물을 단리하였다. It was isolated a white wax solid. 실시예 4A (화합물 E)의 구조를 1H 및 13C NMR로 확인하였다. The structure of Example 4A (compound E) was confirmed by 1H and 13C NMR. 이것의 왁스 성질 때문에, 유의한 양의 충전제를 실시예 4A에 첨가하는 것은 매우 어려운 것으 로 밝혀졌으며, 페이스트 제형은 이 화합물로 만들어지지 않았다. 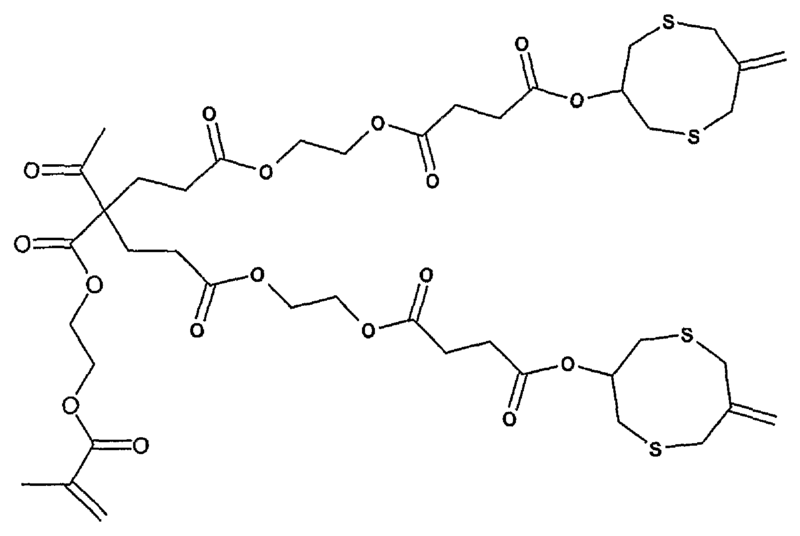 Because of this property of the wax, the addition of filler in a significant amount in Example 4A was found to be very difficult geoteu, paste formulations were made with the compound. 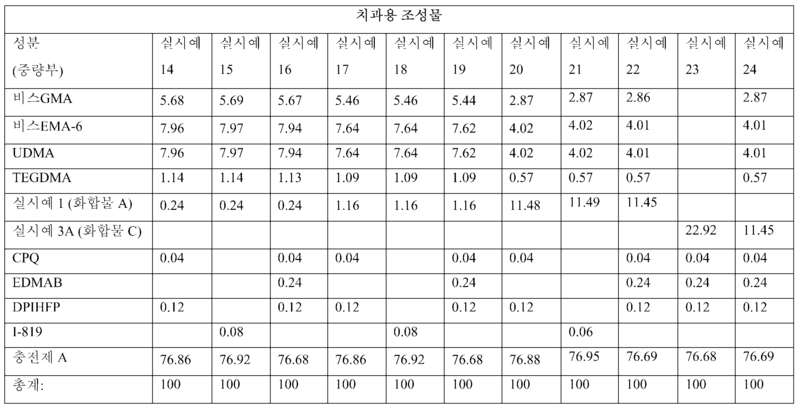 1-(2-아크릴로일옥시에틸)-2-(7-메틸렌-1,5-다이티아옥탄-3-일) 석시네이트 (실시예 3B, 5.25 g, 0.0134 mol), 이어서 2 드롭의 DBU를 유리 바이알에 넣었다. 1- (2-acryloyloxyethyl) -2- (7-methylene-1,5-dimethyl-thiazol-octane-3-yl) succinate (Example 3B, 5.25 g, 0.0134 mol), followed by a second drop DBU It was placed in a glass vial. 이 성분들을 30초 동안 수동 혼합하고, 이어서 2-(메타크릴로일옥시)에틸 아세토아세테이트(1.35 g, 0.0068, 시그마-알드리치)를 첨가하고, 그 후 1분 동안 수동 혼합하였다. Manually mixed for 30 seconds, the two components, followed by 2- (methacryloyloxy) ethyl acetoacetate (1.35 g, 0.0068, Sigma-Aldrich) was added, and the mixture was manually mixed for 1 minute after that. 이 바이알을 실온에 3시간 동안 남겨두었으며, 그동안 생성물은 무색 점성 액체로서 정량적인 수율로 형성되었다. It was both the vial and leave for 3 hours at room temperature, during which time the product was formed in quantitative yield as a colorless viscous liquid. 실시예 4B(화합물 F)의 구조를 1H 및 13C NMR로 확인하였다. The structure of Example 4B (Compound F) was confirmed by 1H and 13C NMR. 이것의 고점성 성질 때문에, 유의한 양의 충전제를 실시예 4B에 첨가하는 것은 매우 어려운 것으로 밝혀졌으며, 페이스트 제형은 이 화합물로 만들어지지 않았다. Because of its high viscosity property, the addition of filler in a significant amount in Example 4B was found to be very difficult, paste formulations were made with the compound. C-8 알코올의 메타크릴레이트 유도체("하이브리드" 화합물)를 함유하는 치과용 조성물을 하기와 같이 제조하였다: 55℃에서 3시간 동안 유리병 안에서 혼합물을 기계적으로 혼합하여, 광개시제 성분(예를 들어, CPQ, EDMAB, 및 DPIHFP)을 먼저 비스GMA 중에 용해시켰다. C-8 was prepared as a dental composition containing a methacrylate derivative ( "hybrid" compounds) of the alcohol: a mixture of from 55 ℃ the mixture mechanically in a vial for 3 hours, the photoinitiator component (e. G. a, CPQ, EDMAB, and DPIHFP) were first dissolved in bis GMA. 이어서, 다른 성분들 (충전제 포함)을 칭량하여 스크류 캡(screw cap)이 있는 맥스(MAX) 20 플라스틱 혼합 컵 (플랙텍(Flakteck), 미국 사우쓰캐롤라이나주 랜드럼 소재)에 넣었다. Then, weighed and placed in a screw cap (screw cap) is MAX (MAX) 20 plastic mixing cup (Flack Tek (Flakteck), the United States, the South Carolina LAN drum material) with the other ingredients (including filler). 컵을 85℃ 오븐 내에 30분간 두었다. It was placed for 30 minutes in the cup 85 ℃ oven. 이어서, 모든 성분들을 합하고 DAC 150 FV 스피드 믹서 (플랙텍)에서 314.2 rad/s(3000 rpm)로 1분간 혼합하였다. Then, all the ingredients were combined and mixed for one minute at DAC 150 FV speed mixer (Flack Tek) to 314.2 rad / s (3000 rpm). 85℃ 에서 30분간 가열하고 그 후 혼합을 2회 반복하였다. Heated at 85 ℃ 30 min and was repeated twice and then mixed. 치과용 조성물(실시예 5-9)은 페이스트 복합재와 같이 이러한 방식으로 제조하고, 각각의 복합재에 있어서 성분들의 상대적인 양은 표 1에 열거하였다. Dental compositions (Examples 5-9) are manufactured in this manner as paste composites, are listed in Table 1. The relative amounts of the components in each of the composite material. 비교예 1 및 2는, 조성물이 "하이브리드" 화합물 대신 C-8 알코올의 다이우레 탄(C-8 다이우레탄) 유도체 및 아세테이트 (C-8 아세테이트)를 함유한다는 것을 제외하고는 유사한 방식으로 제조하였다 (표 1). Comparative Examples 1 and 2, were prepared in a similar manner, except that the composition contains a "hybrid" compounds instead of C-8 die urethane carbon (C-8 die urethane) derivatives, and acetate (C-8 Acetate) of alcohol (Table 1). 이들 복합재 페이스트(실시예 5-9)는 본 명세서에 설명된 시험 방법에 따라 간접 인장 강도(DTS), 왓츠 수축성, 바콜 경도, 및 시각적 불투명도에 대하여 평가하고, 그 결과를 쓰리엠 필텍 슈프림 유니버셜 리스토러티브 (쓰리엠 컴퍼니) 상품으로부터의 결과와 비교하였다. These composite pastes (Examples 5-9) and is evaluated with respect to the tensile strength (DTS) according to the test methods described herein, Watts shrinkage, Barcol hardness, and visual opacity, the result 3M piltek Supreme Universal Restorative Executive (3M Company) were compared with the results from the product. 평가 결과가 표 2에 제공되어 있다. The evaluation results are provided in Table 2. 비교예 1 및 2는 가시광에의 노출시 (엘리파르 프리라이트 경화등(쓰리엠 컴퍼니)으로부터의 가시광에의 20 내지 30초간의 노출시) 중합(즉, 경화)되지 않으며, 따라서 평가 결과가 얻어지지 않았다. Comparative Examples 1 and 2 upon exposure to visible light (Eli Parr-free when the visible light exposure of 20 to 30 seconds of the from the light curing light (3M Company)) is not the polymerization (i.e., curing), and thus the result is not obtained It did. 표 2의 결과로부터, 본 발명의 치과용 복합재(실시예 5-9)는 일반적으로 우수 내지는 탁월한 기계적 강도(DTS 및 바콜 경도 값) 및 미적(시각적 불투명성 값) 특성을 유지하면서, 상용 필텍 슈프림 리스토러티브 제품과 비교하여 유의하게 개선된 수축성에 대한 값을 나타낸다는 결론을 내릴 수 있다. 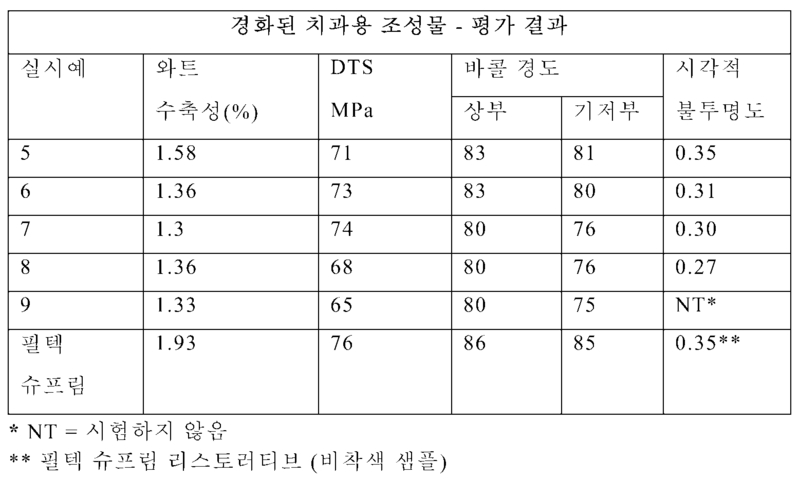 (Example 5-9) from the results of Table 2, the dental composites of the present invention, while generally maintaining the excellent naejineun excellent mechanical strength (DTS and Barcol hardness values) and aesthetic (Visual Opacity values) properties, commercial piltek Supreme lease It represents the value for a significantly improved shrink properties in comparison with the executive Restorative product can make a conclusion. C-8 알코올의 메타크릴레이트 유도체("하이브리드" 화합물)를 함유하는 치과용 조성물을 하기와 같이 제조하였다: 유리병 안에서 혼합물을 기계적으로 혼합하여, 광개시제 성분(즉, CPQ, EDMAB, 및 DPIHFP)을 먼저 "하이브리드" 화합물에 용해시켰다. C-8 was prepared as a dental composition containing a methacrylate derivative ( "hybrid" compounds) of the alcohol: a mixture of the mixture in a glass bottle with a mechanical, photo-initiator component (i.e., CPQ, EDMAB, and DPIHFP) the first was dissolved in a "hybrid" compounds. 이어서 충전제를 첨가하고, 모든 성분들은 생성된 페이스트가 균질해질 때까지 혼합하였다. Followed by addition of the filler, and the components are mixed until the resulting paste is homogeneous. 이러한 방식으로 치과용 조성물(실시예 10-13)을 페이스트 복합재로서 제조하였고, 각 복합재의 성분들의 상대적인 양을 표 3에 열거하였다. In this manner it was prepared the dental composition (Examples 10-13) as a paste composite, and the relative amounts of the components listed for each composite are shown in Table 3. 이들 복합재 페이스트(실시예 10-13)는 본 명세서에 설명된 시험 방법에 따라 바콜 경도에 대하여 평가하였으며, 그 결과는 표 4에 제공되어 있다. These composite pastes (Examples 10-13) were evaluated for Barcol hardness according to the Test Method described herein and the results are provided in Table 4. 표 4의 결과로부터, 본 발명의 치과용 복합재(실시예 10-13 각각은 단량체 수지로서 단일한 "하이브리드" 화합물만을 포함함)가 우수 내지는 탁월한 바콜 경도 값을 나타낸다는 결론을 내릴 수 있다. From the results of Table 4, the dental composites of the present invention (Examples 10 to 13 each of which also includes only a single "hybrid" compounds as the monomer resin) can make a conclusion shows that the excellent naejineun excellent Barcol hardness values. C-8 알코올의 메타크릴레이트 유도체("하이브리드" 화합물)를 함유하는 치과용 조성물을 하기와 같이 제조하였다: 광개시제 성분 (예를 들어, CPQ, EDMAB, DPIHFP 및 I-819), 메타크릴레이트 단량체, (비스GMA, 비스EMA6, UDMA 및 TEGDMA) 및 C-8 알코올의 메타크릴레이트 유도체를 스크류 캡이 있는 맥스 20 플라스틱 혼합 컵 (플랙텍)에 칭량하여 넣었다. 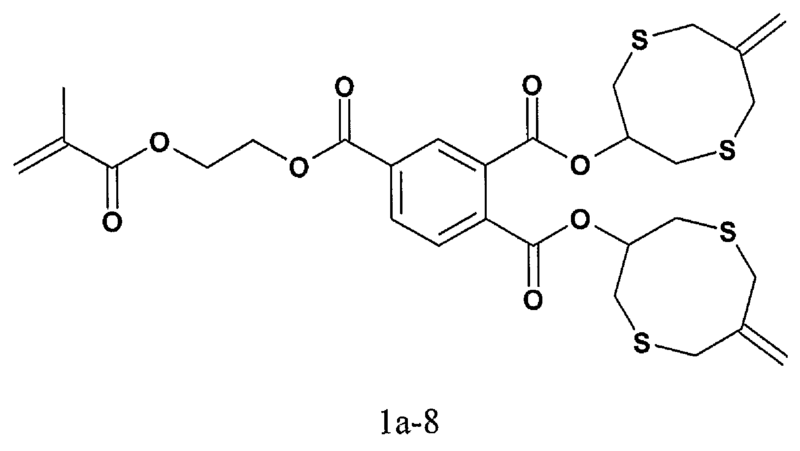 C-8 was prepared as a dental composition containing a methacrylate derivative ( "hybrid" compounds) of alcohol: photoinitiator components (e.g., CPQ, EDMAB, DPIHFP, and I-819), methacrylate monomer and placed in a weighed (bis-GMA, bis EMA6, UDMA and TEGDMA) and C-8 alcohol methacrylate 20 plastic mixing cup rate derivative Max with a screw cap (Flack Tek). 컵을 85℃ 오븐 내에 5분간 두고, 이어서 DAC 150 FV 스피드 믹서 (speed mixer)(플랙텍)에서 314.2 rad/s(3000 rpm)로 1분간 혼합하였다. A cup with five minutes in a 85 ℃ oven, then mixed for one minutes at a DAC 150 FV speed mixer (mixer speed) 314.2 rad / s (3000 rpm) at (Flack Tek). 이어서, 충전제 성분을 첨가하고, 컵을 85℃ 오븐 내에 5분간 두고, DAC 150 FV 스피드 믹서 (플랙텍)에서 314.2 rad/s(3000 rpm)로 1분간 혼합하였다. Then, with the addition of the filler component, the cup 5 minutes in the oven 85 ℃, DAC 150 FV speed mixer and mixed for 1 minute (Flack Tek) 314.2 rad / s (3000 rpm) at. 85℃에서 5분간 가열하고 그 후 혼합을 1회 반복하였다. Heated at 85 ℃ 5 min and was repeated once and then the mixture. 이러한 방식으로 치과용 조성물(실시예 14-24)을 페이스트 복합재로서 제조하였고, 각 복합재의 성분들의 상대적인 양을 표 5에 열거하였다. In this manner it was prepared the dental composition (Examples 14-24) as a paste composite, and the relative amounts of the components listed for each composite are shown in Table 5. 본 명세서에 기재된 시험 방법에 따라서 이러한 복합재 페이스트(실시예 14-24)를 왓츠 수축성 및 바콜 경도에 대하여 평가하고, 그 결과를 상품 쓰리엠 필텍 슈프림 유니버셜 리스토러티브(쓰리엠 컴퍼니)로부터의 결과와 비교하였다. It was compared with the results from these composite pastes (Examples 14-24) for Watts shrinkable and evaluated for Barcol hardness, and as a result the product 3M piltek Supreme Universal Restorative (3M Company) according to the test method described herein . 평가 결과를 표 6에 제공한다. It provides the results of the evaluation are shown in Table 6. 표 4의 결과로부터, 본 발명의 치과용 복합재(실시예 14-24)는 일반적으로 우수 내지는 탁월한 경도(바콜 경도 값)를 유지하면서, 상용 필텍 슈프림 리스토러티브 제품과 비교하여 일반적으로 개선된 수축성에 대한 값을 나타낸다는 결론을 내릴 수 있다. From the results of Table 4, the dental composites of the present invention (Examples 14-24) are typically compared to the commercial piltek Supreme Restorative products, while maintaining the excellent hardness (Barcol hardness values) naejineun excellent generally improve contractility It represents the value for the can to make a conclusion. 본 발명의 범위 및 취지를 벗어나지 않고도 본 발명에 대한 다양한 변형 및 변경이 당업자에게 명백하게 될 것이다. Various modifications and variations of the present invention without departing from the scope and spirit of the present invention will become apparent to those skilled in the art. 본 발명을 본 명세서에 설명된 특정 실시 형태 및 실시예로 부당하게 제한하려는 것이 아니며, 그러한 실시 형태 및 실시예는 단지 본 발명을 예시하기 위해서 제시되고, 본 발명의 범주는 첨부된 청구의 범위에 의해서만 제한하고자 함을 이해하여야 한다. Is not intended to unduly limit the invention to the specific embodiments and examples described herein, such embodiments and examples are only presented in order to illustrate the invention, the scope of the invention in the appended claims it should be understood solely intended to limit. 본 명세서에서 인용된 특허들, 특허 문서들, 및 출판물들의 전 개시 내용은 각각이 개별적으로 포함되는 것처럼 본 명세서에 전체적으로 포함되어 참고된다. The cited patent in the present specification, before launch of the patent documents, and publications of which are note included in the present specification as a whole, as contained in each of the individual. b는 1임]. b is 1 Im. 를 포함하는 방법에 의해 제조되는 치과용 수복재. Dental restorative material for which is produced by a process comprising the.